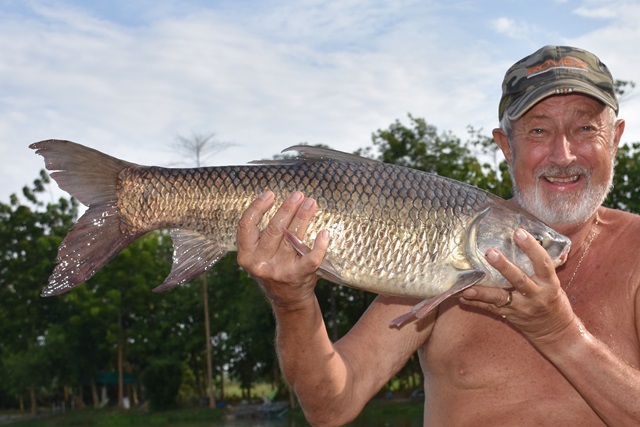 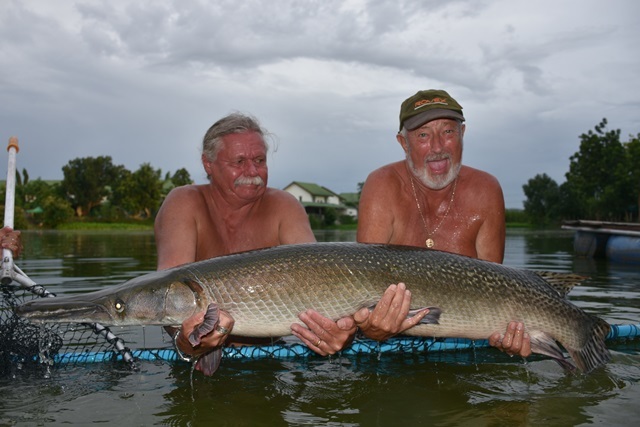 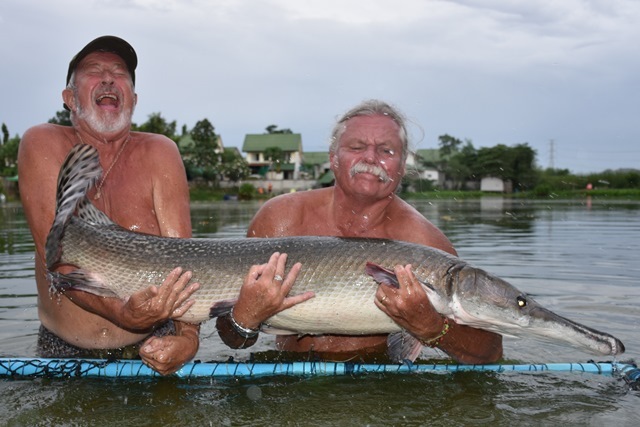 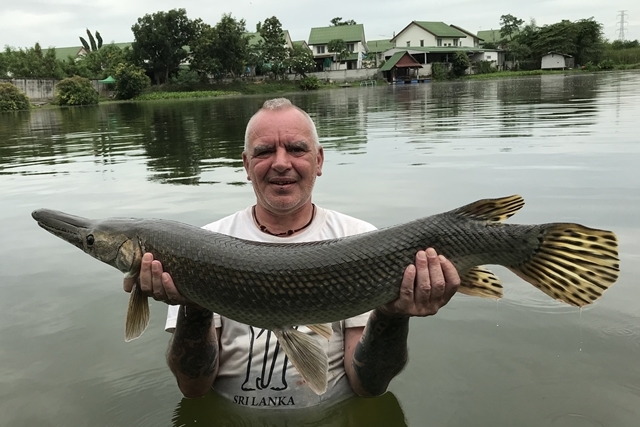 The legendary John Wilson MBE was back for another session which was topped off by a pb alligator gar and an albino chao phraya which was a new species for John. 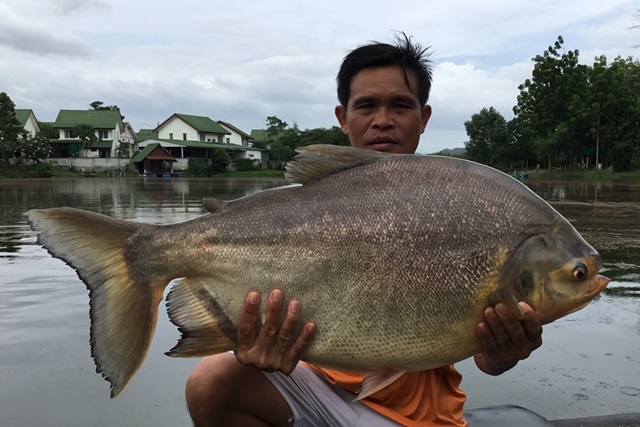 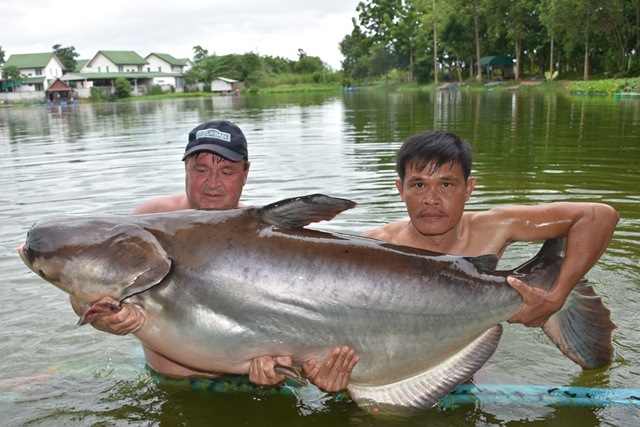 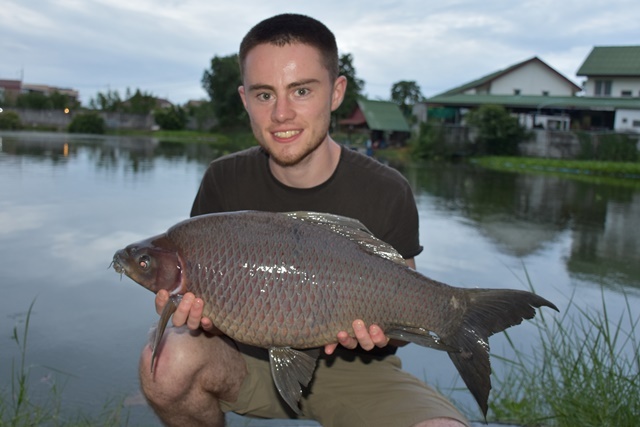 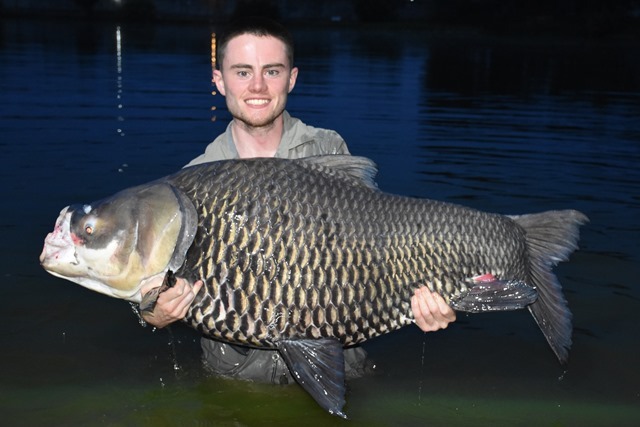 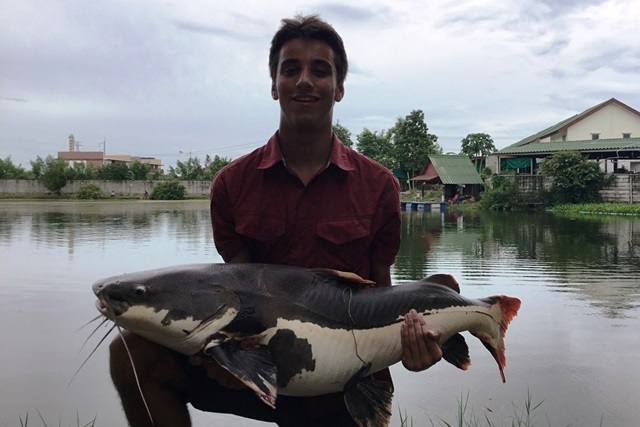 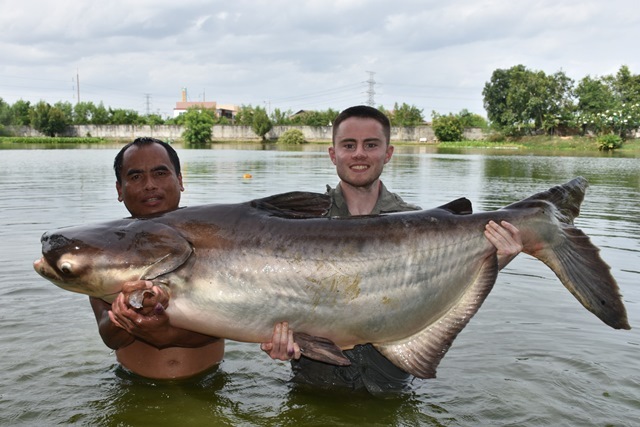 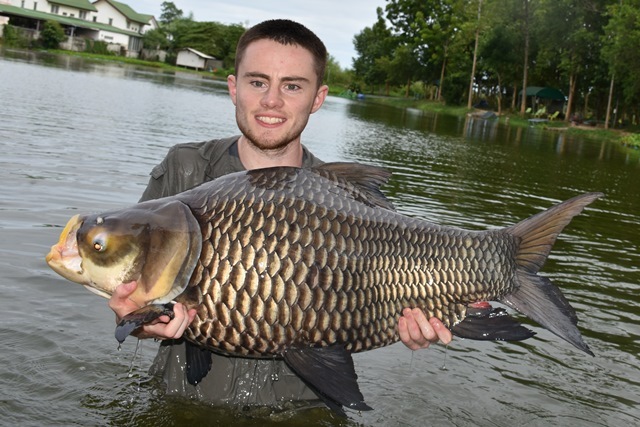 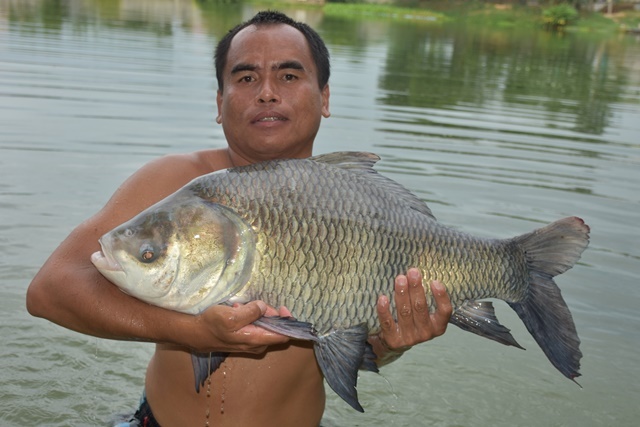 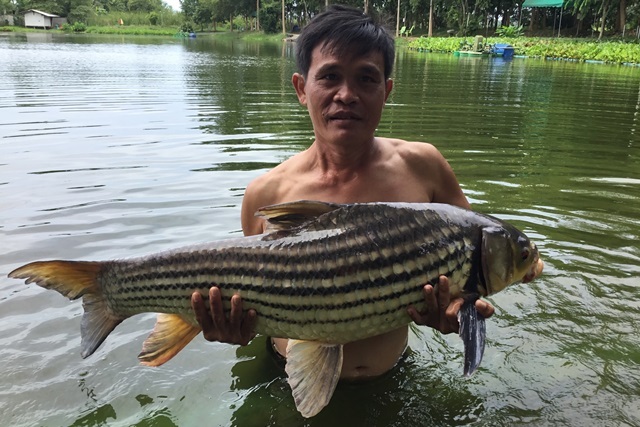 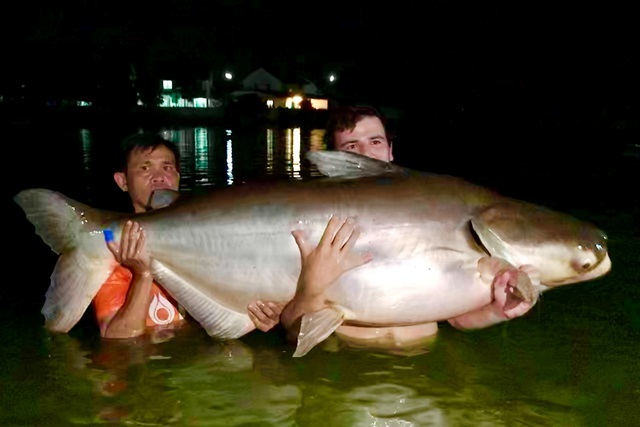 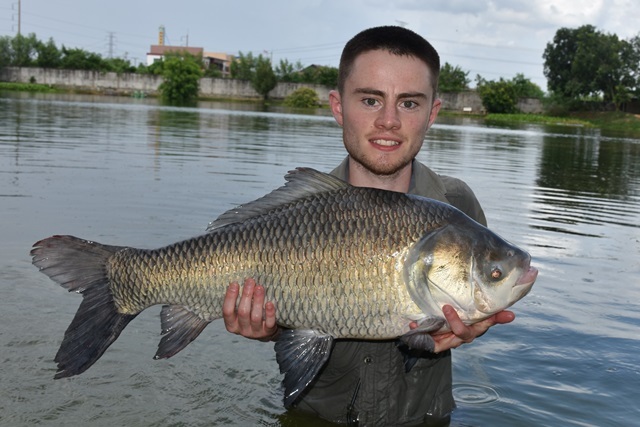 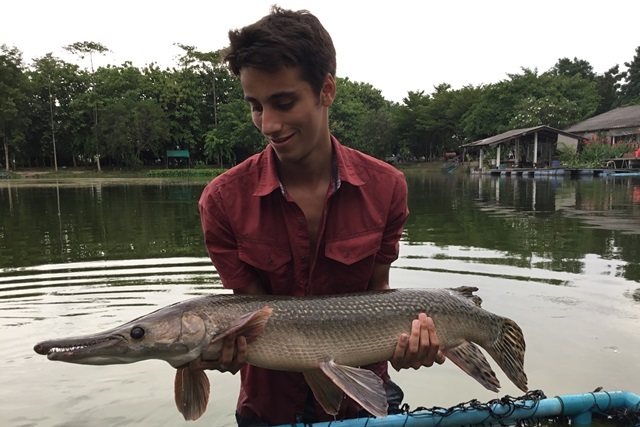 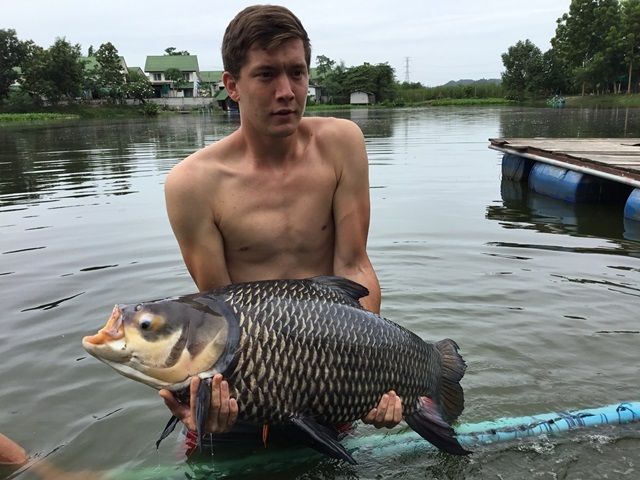 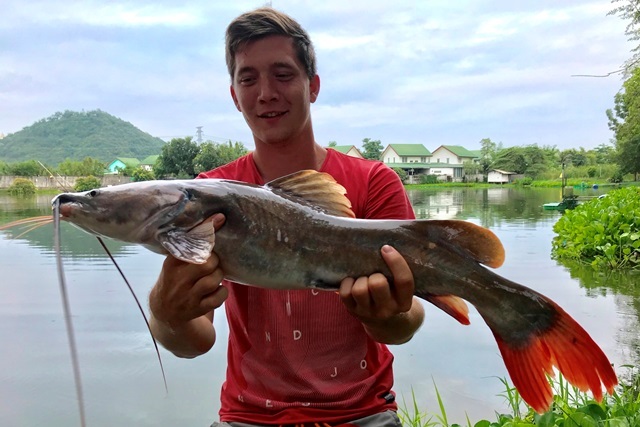 In addition to these wonderful catches he also landed Juliens golden price carp, rohu, Siamese carp, Mekong catfish, chao phraya catfish, mollycot, and Asian redtail. 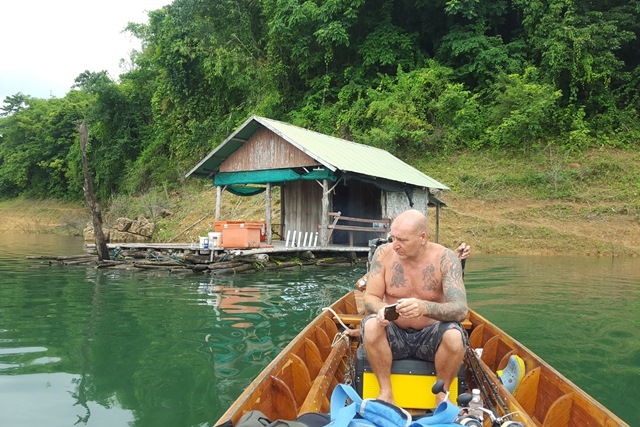 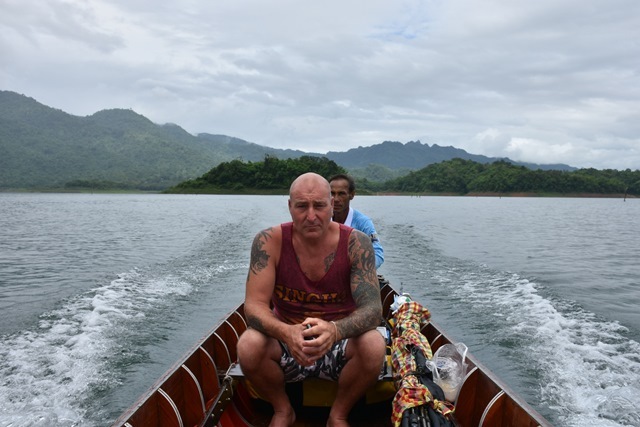 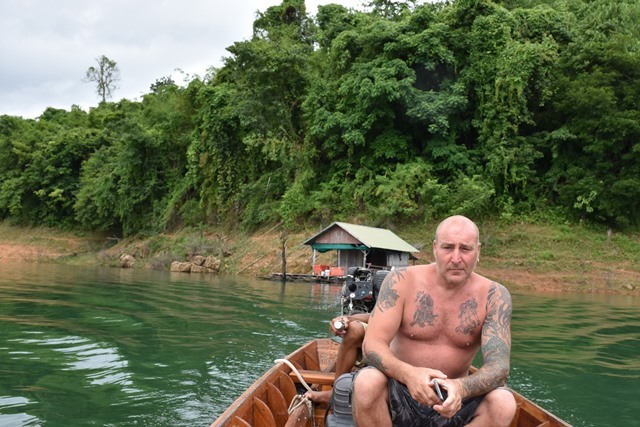 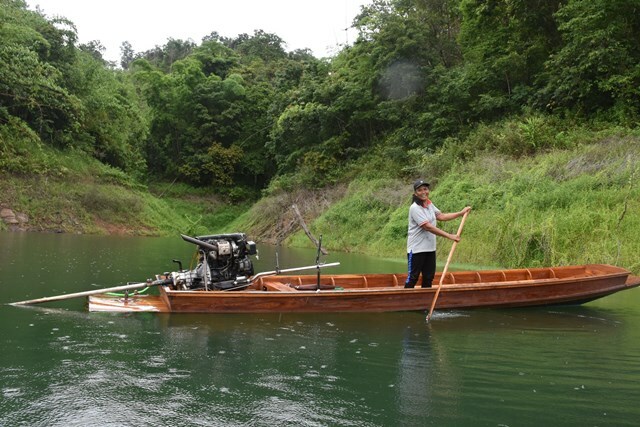 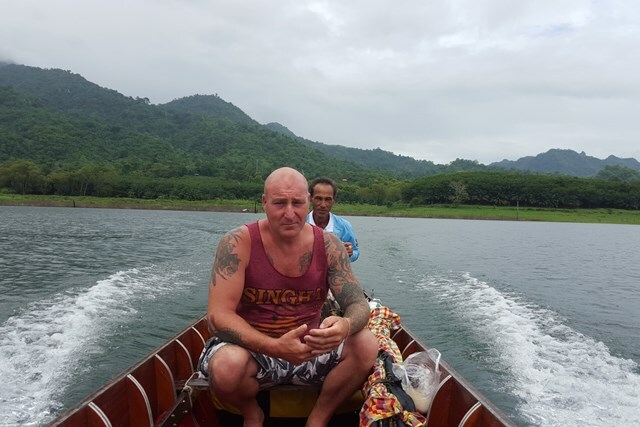 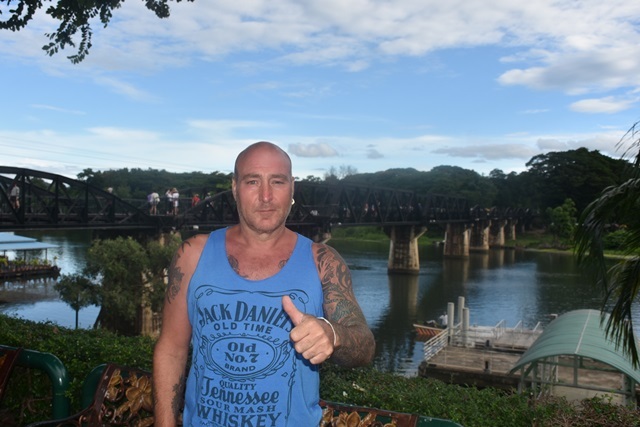 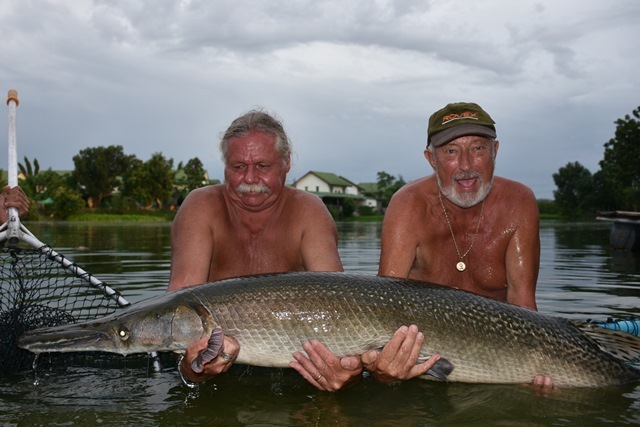 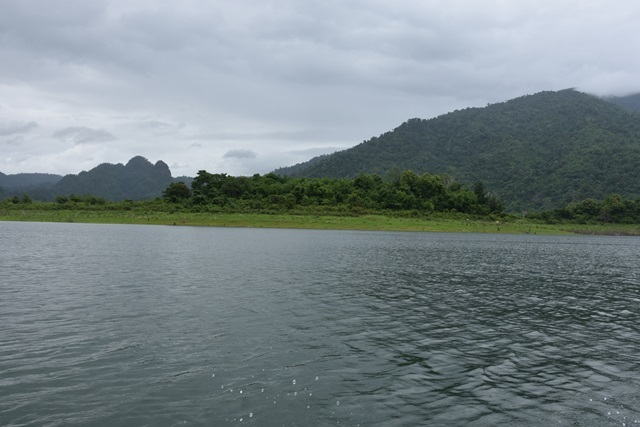 Dolf Van Eijk and Tim went for a session up to the majestic Khao Laem Dam. 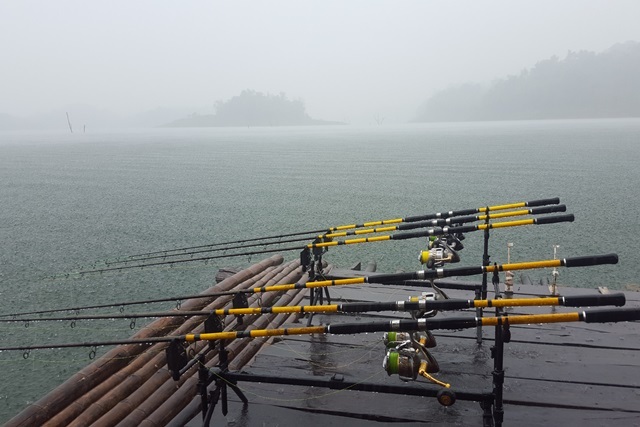 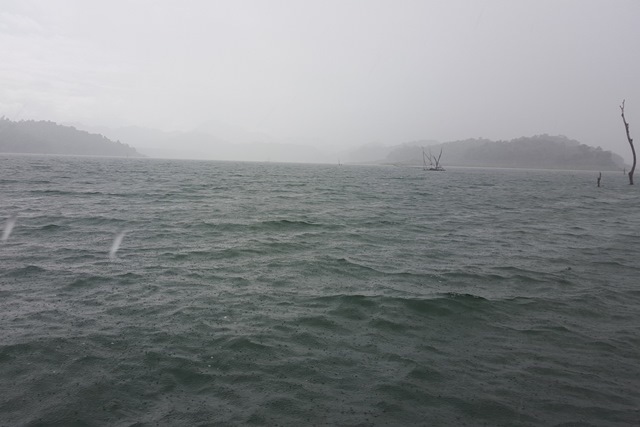 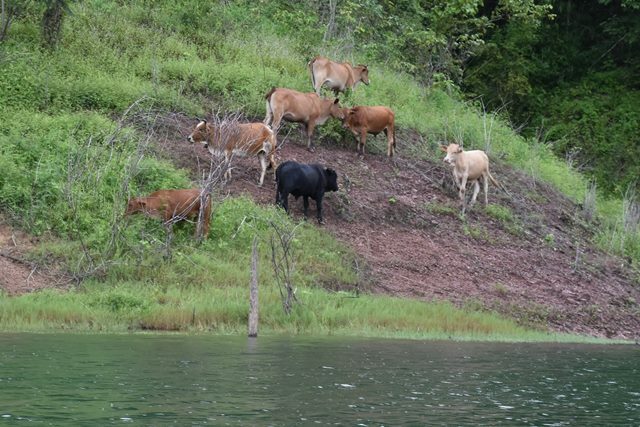 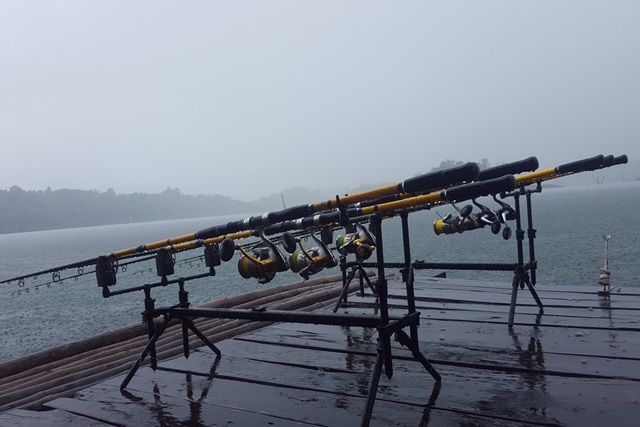 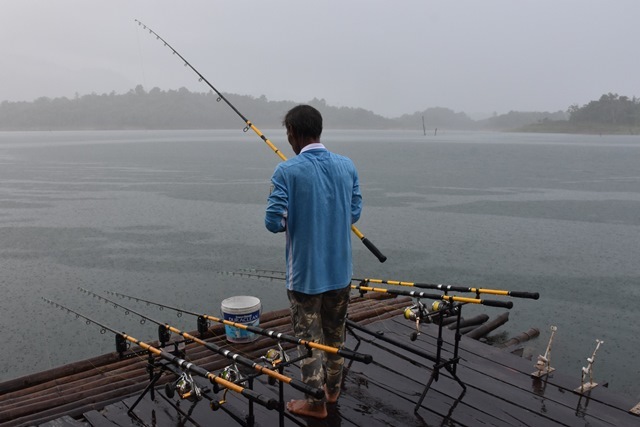 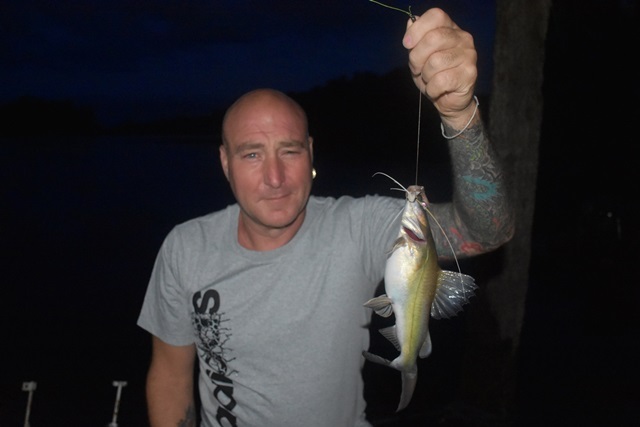 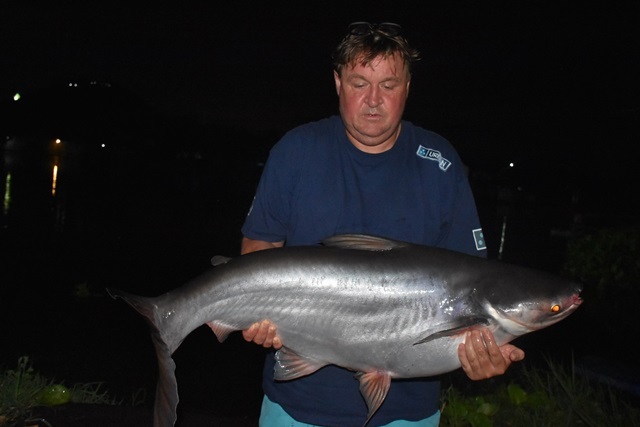 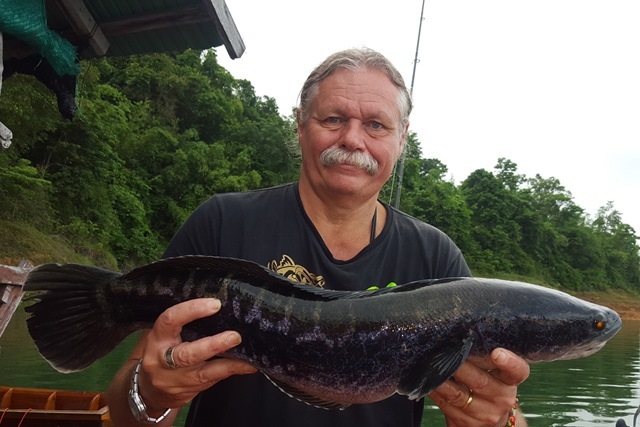 Despite the very heavy rain storms that passed through at regular intervals, they still caught a number of stunning fish that included some awesome wallago attu, giant snakehead, yellow catfish and a black shark minnow that took the fish guts being used for wallago bait. 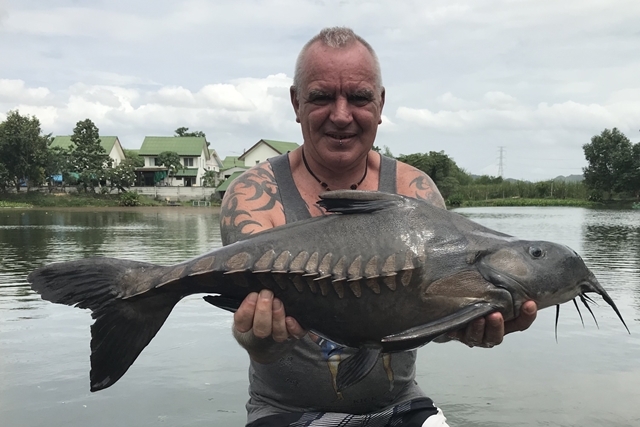 Well what a first session at Palm Tree Jordie (Mark Jordon) had, the pick of the catches being the difficult to catch small scale mud carp and ripsaw catfish, as well as joining the Palm Tree Lagoon BIG Catfish Club landing the friendly Mekong after winning a two hour test of endurance. 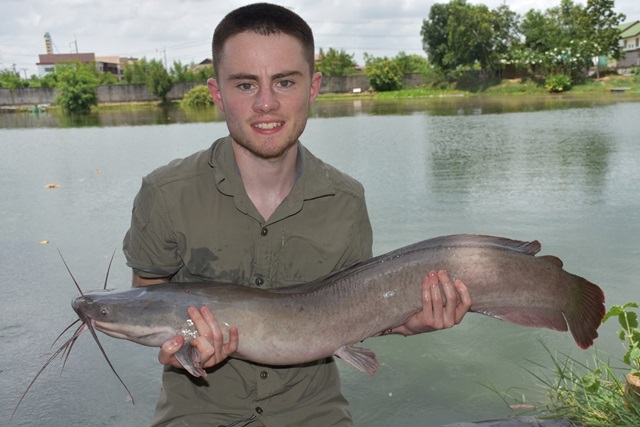 However, he wasn't finished there going on to land a wide variety of other splendid catches that included a number of pbs and new species like Chinese bighead carp, mollycot, catla carp, wallago attu, black shark minnow, Siamese carp, alligator gar, pacu, Juliens golden price carp, striped catfish, leopard catfish, rohu, African walking catfish, chao phraya catfish, big-Y catfish, as well as both Thai and Amazon redtail. 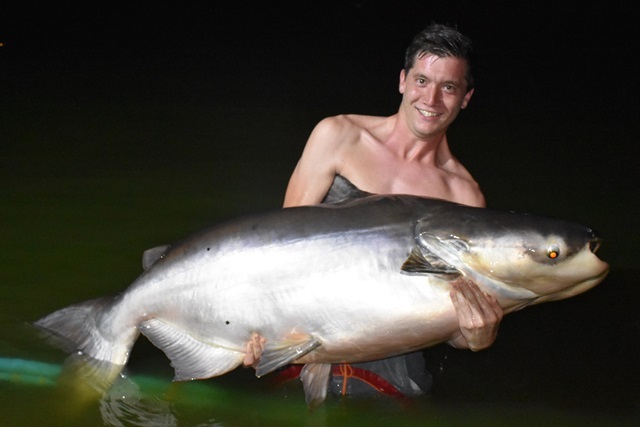 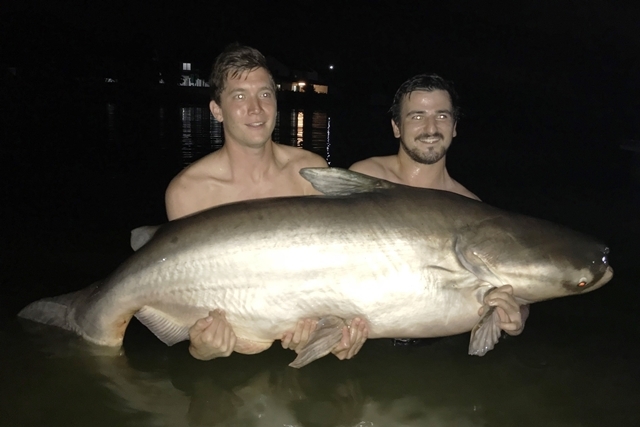 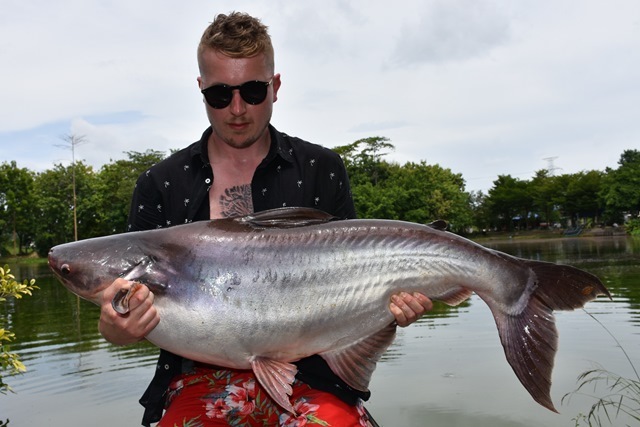 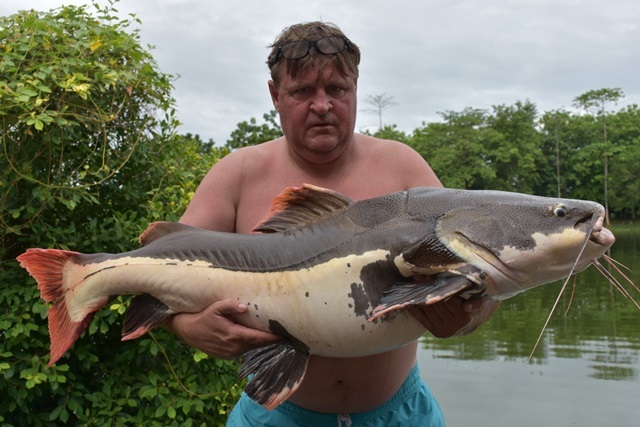 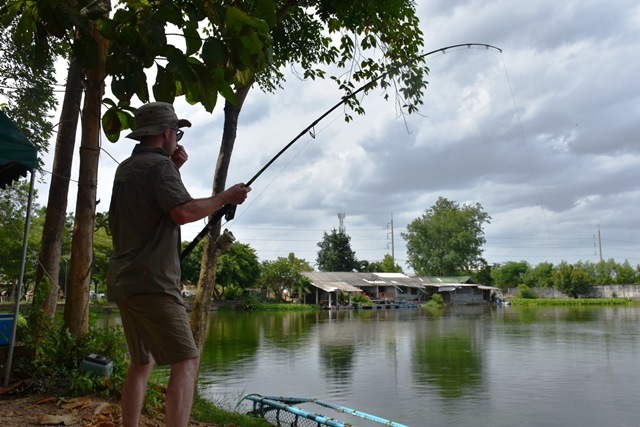 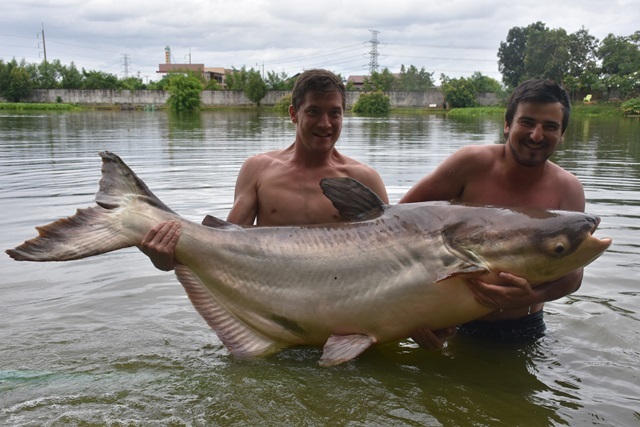 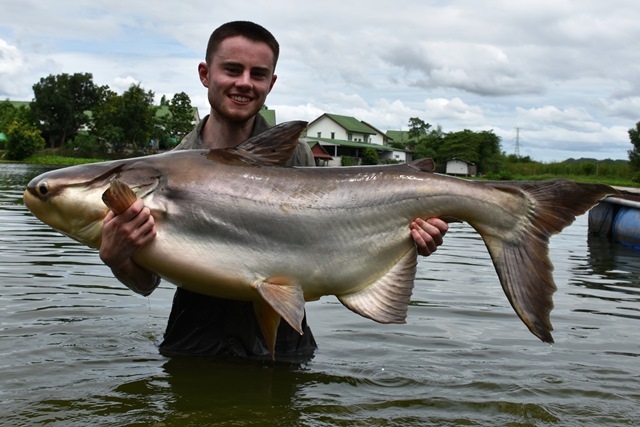 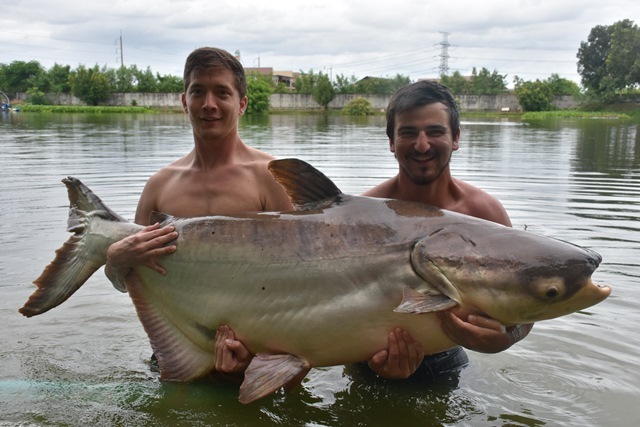 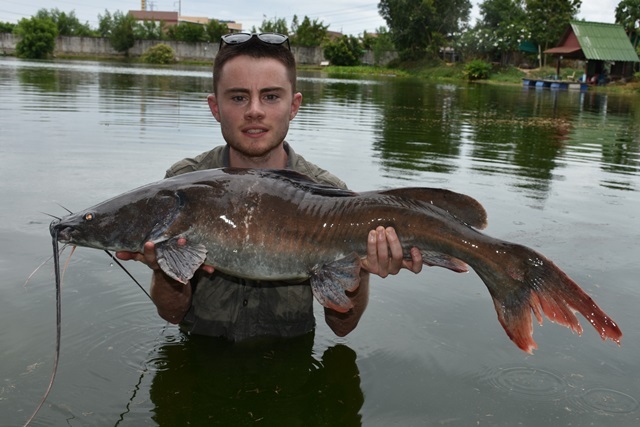 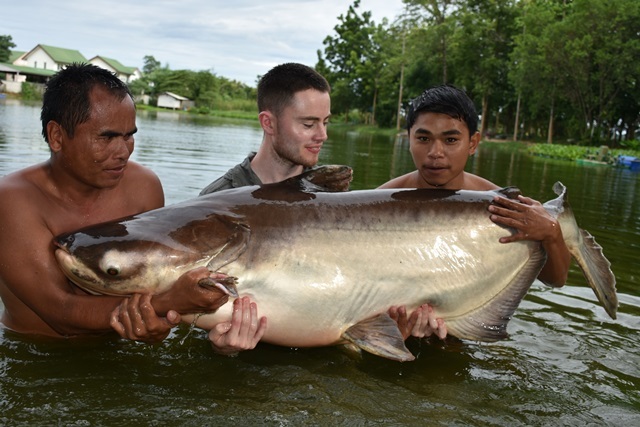 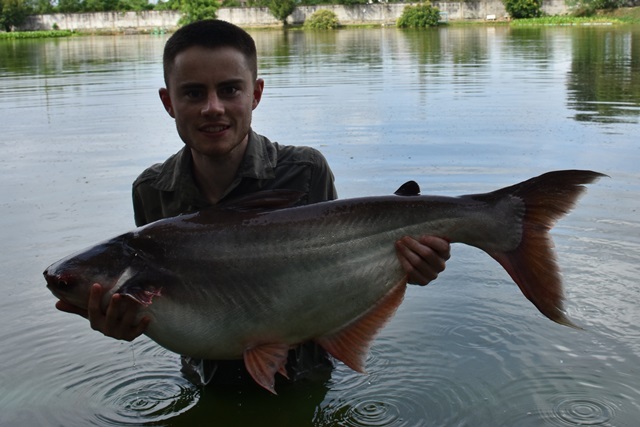 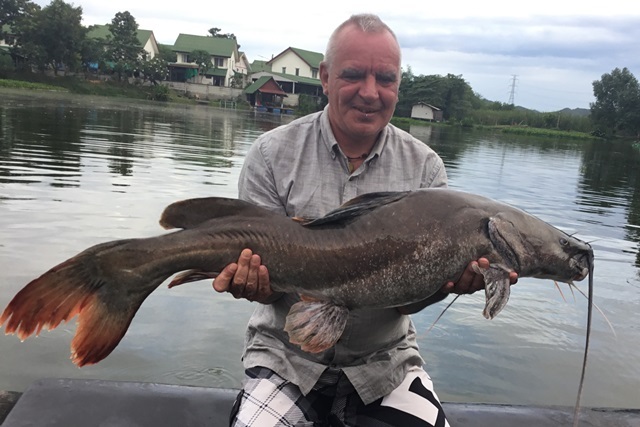 Karl Jones was back this time for a longer stint catching a number of pb catla carp and joining the Palm BIG Catfish Club after a lengthy battle of over two hours with the friendly Mekong. 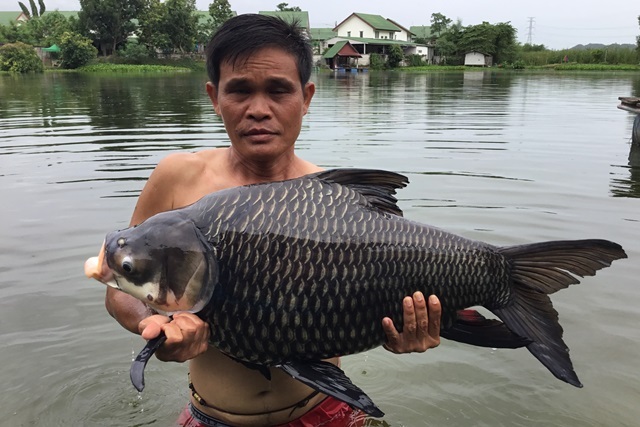 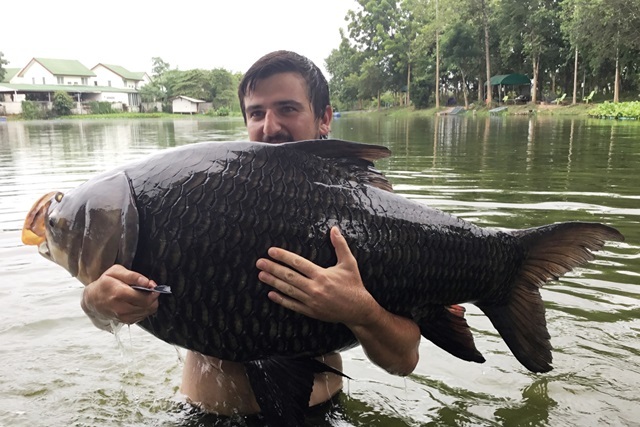 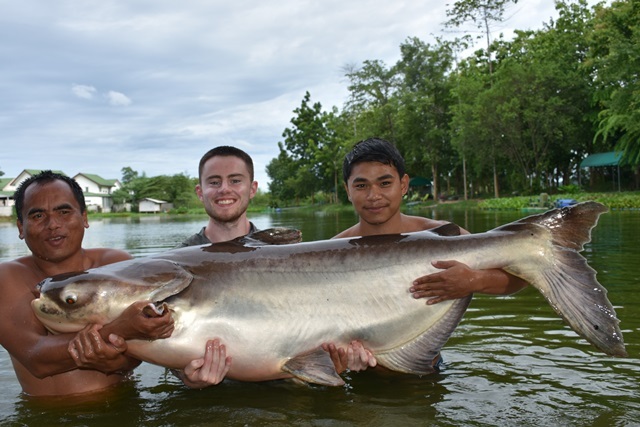 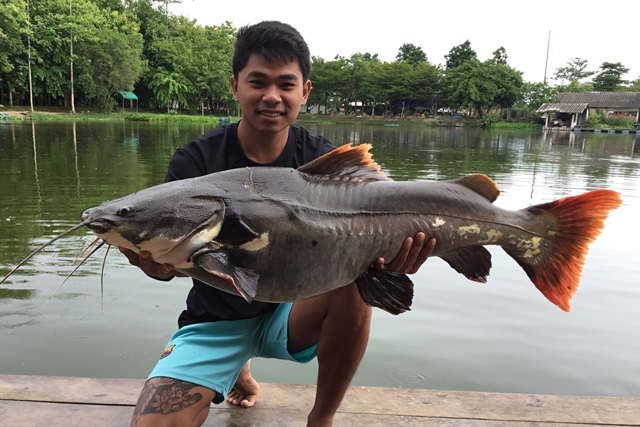 He also caught a variety of other species that included Siamese carp, chao phraya catfish, striped catfish, rohu, African walking catfish, Juliens golden price carp and both Amazon and Thai redtail. 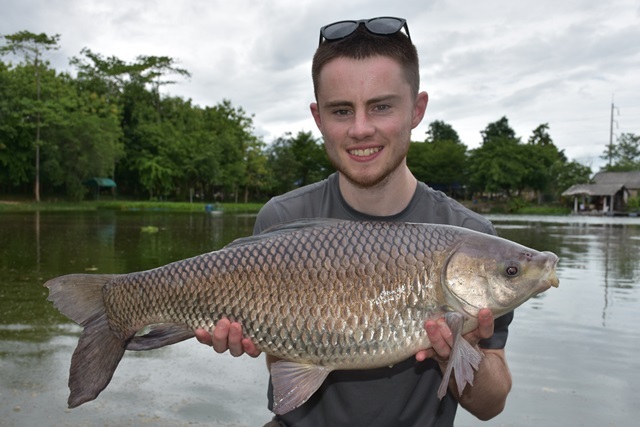 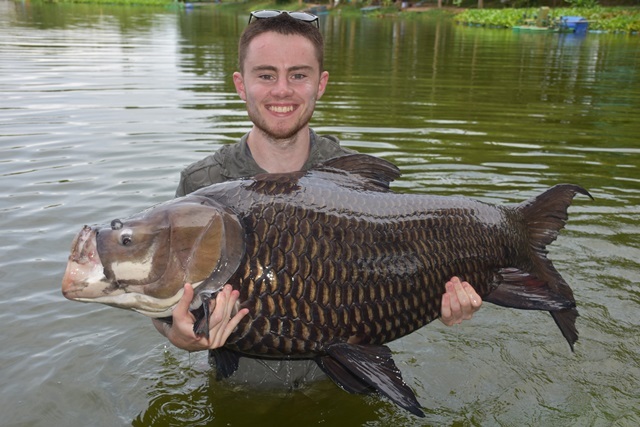 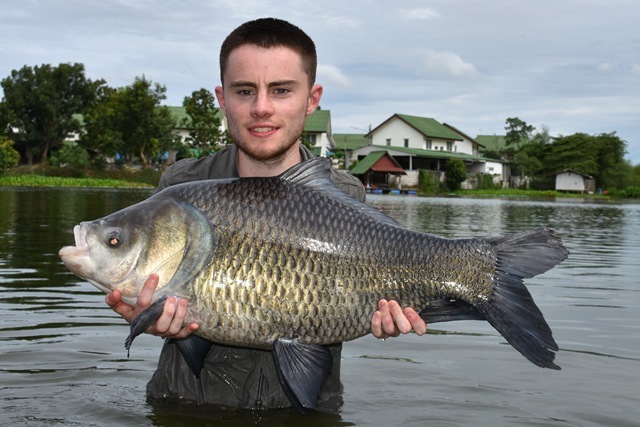 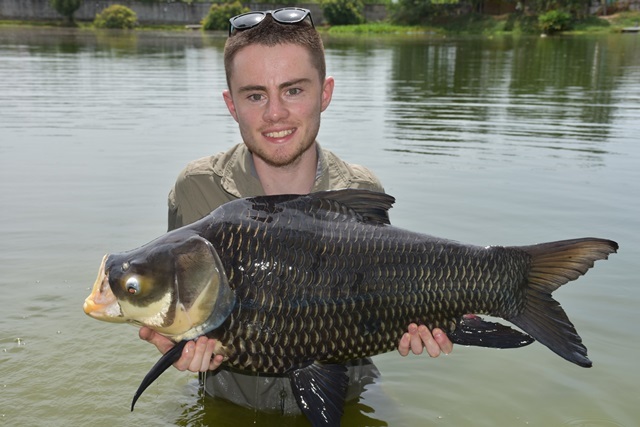 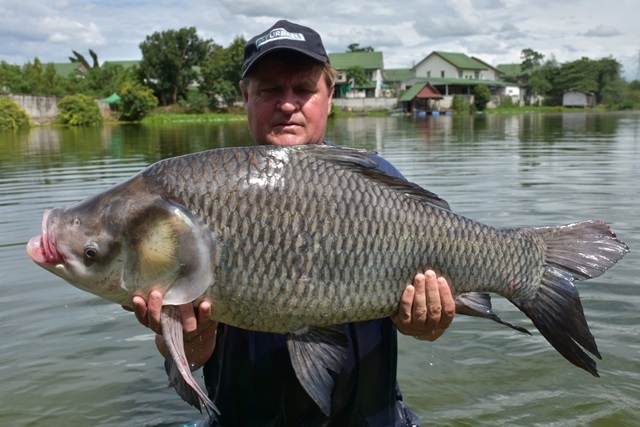 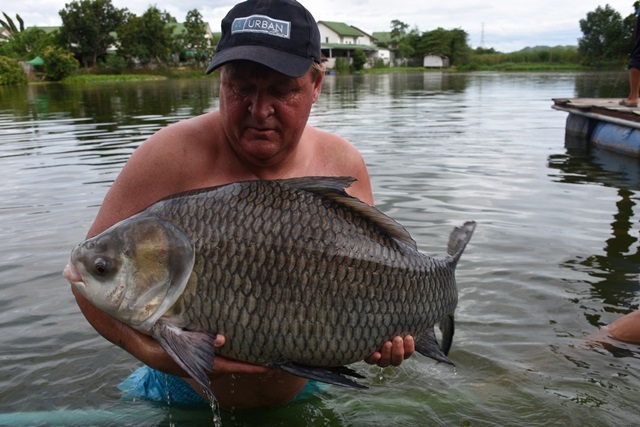 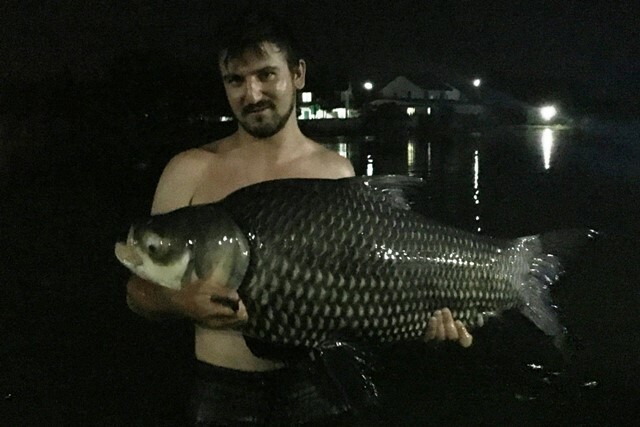 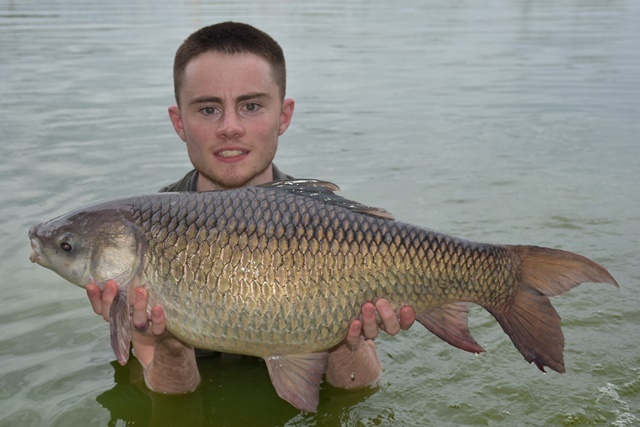 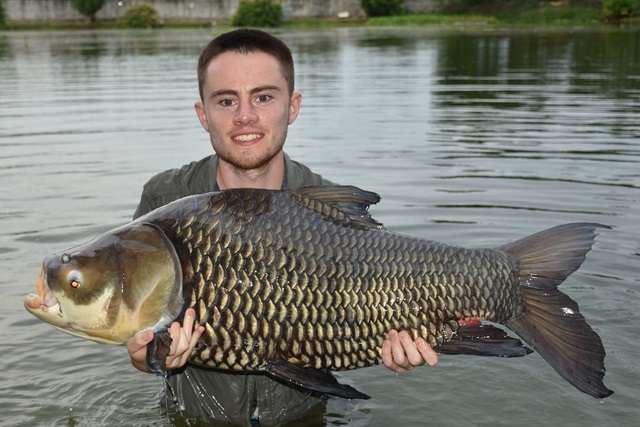 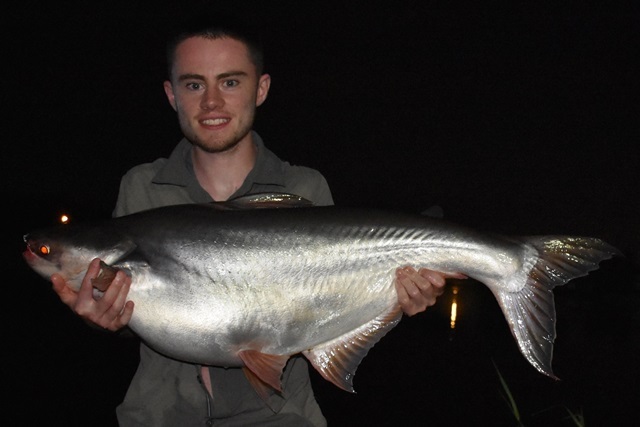 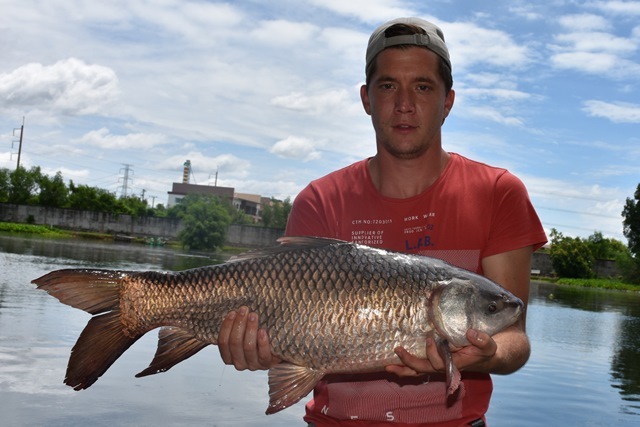 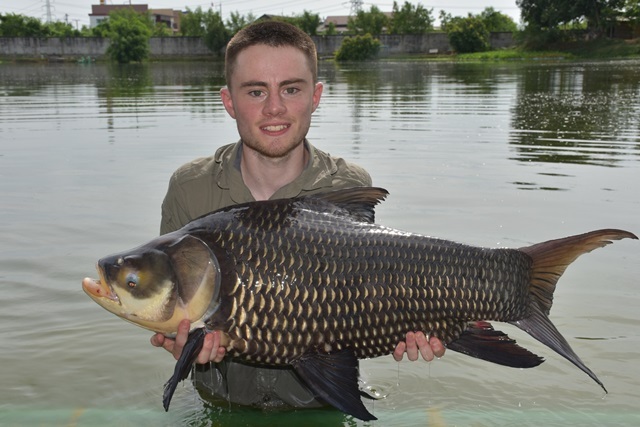 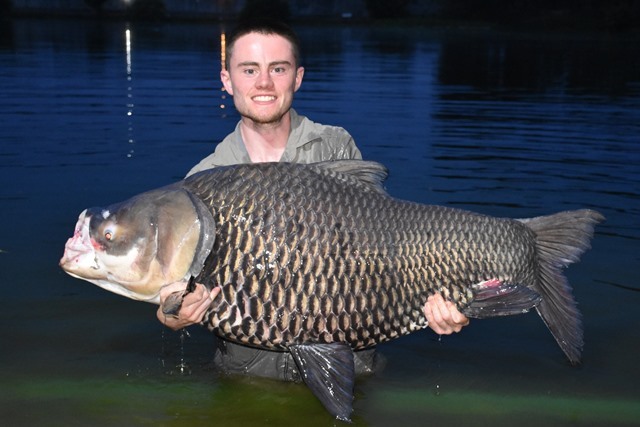 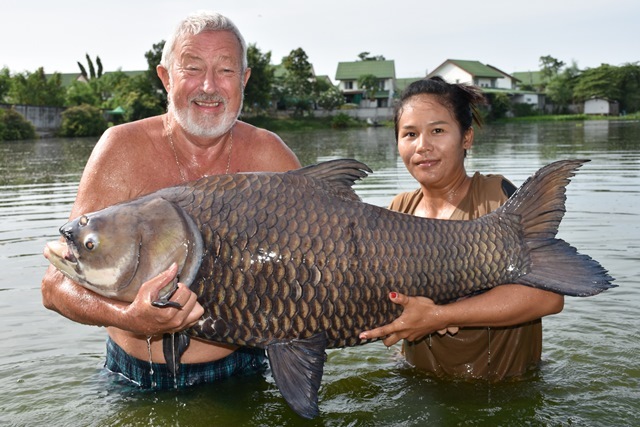 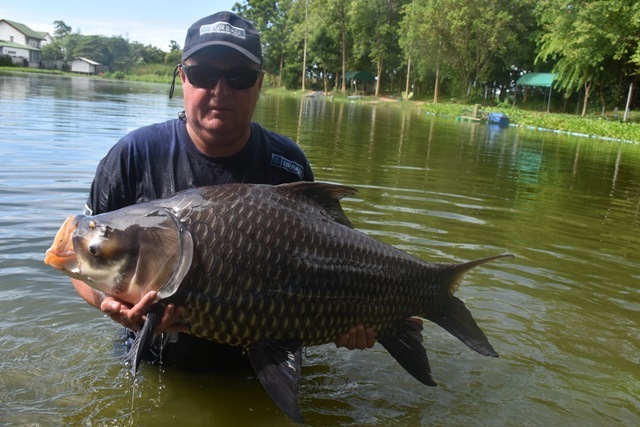 Nick Parker returned to continue his quest for a 100lb Siamese carp. 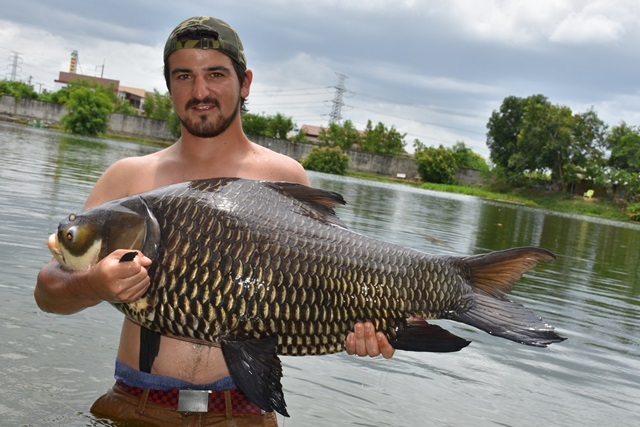 This time he was successfully bagging a 100lber+ on the very first day of his session. 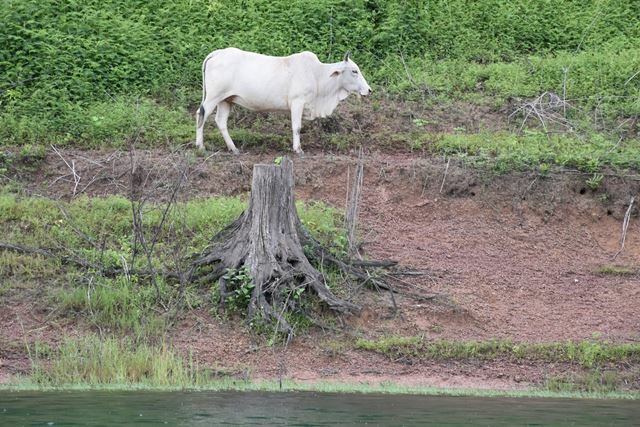 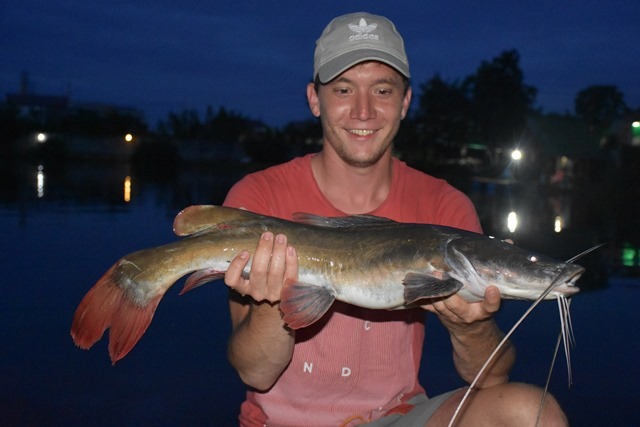 He then went on to beat both his catla carp and Mekong catfish pbs as well as catching a couple of new species in the form of vundu catfish, and black shark minnow. 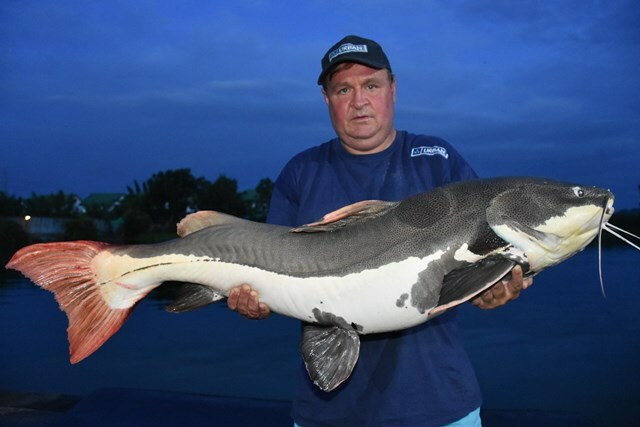 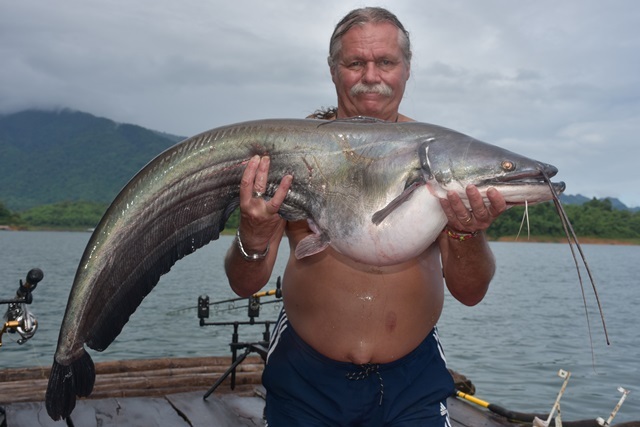 He also landed striped catfish, catfish shark, rohu, as well as both Amazon and Asian catfish. 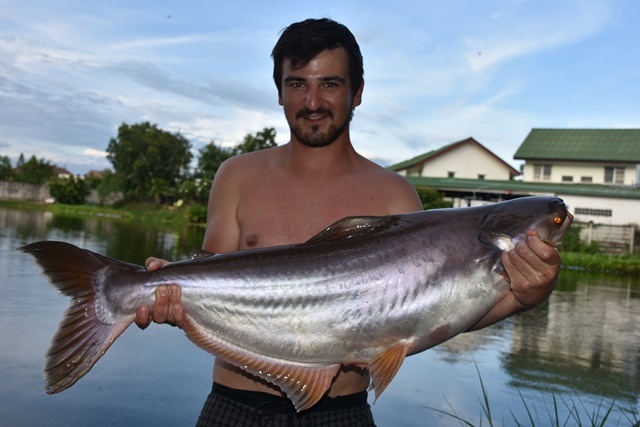 Another Austrian angler whose name escapes me also had a great first session at Palm Tree catching a superb bearded labeo, as well as a large variety of other species like black shark minnow, Siamese carp, Mekong catfish, Juliens golden price carp, rohu, African walking catfish, leopard catfish, striped catfish, yellow catfish, vundu catfish, suckermouth catfish, as well as both Thai and Amazon redtail. 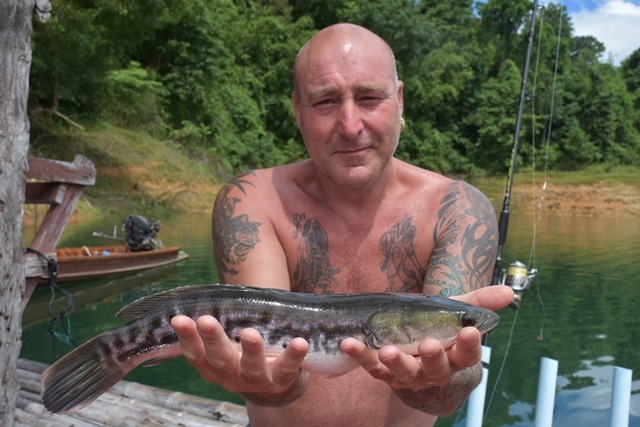 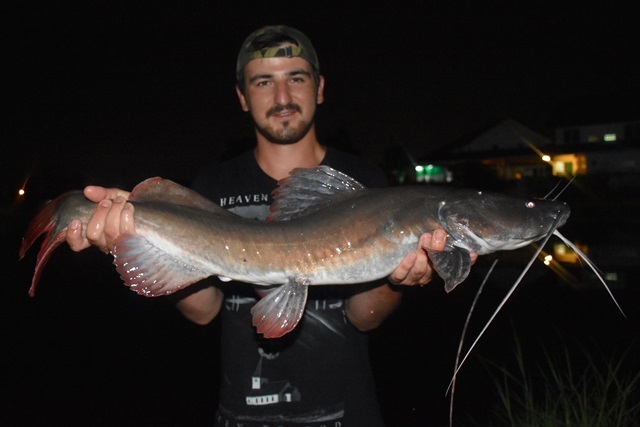 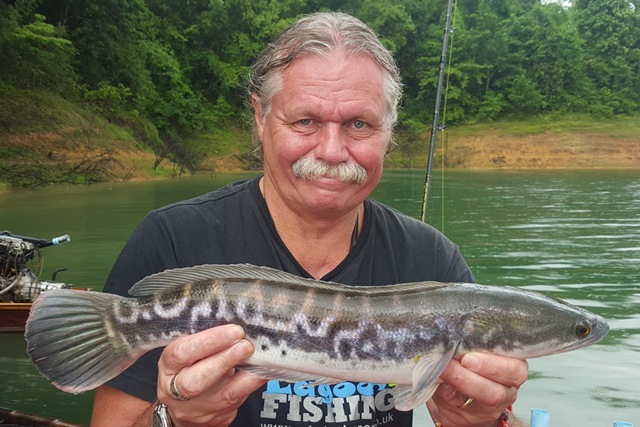 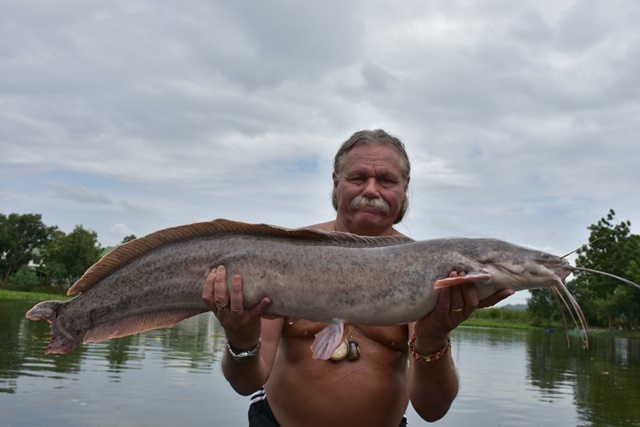 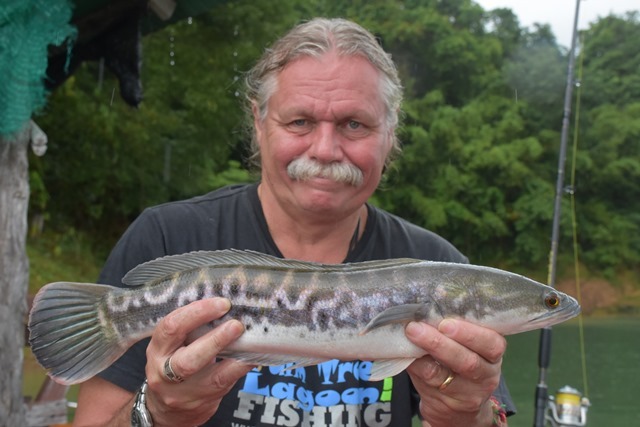 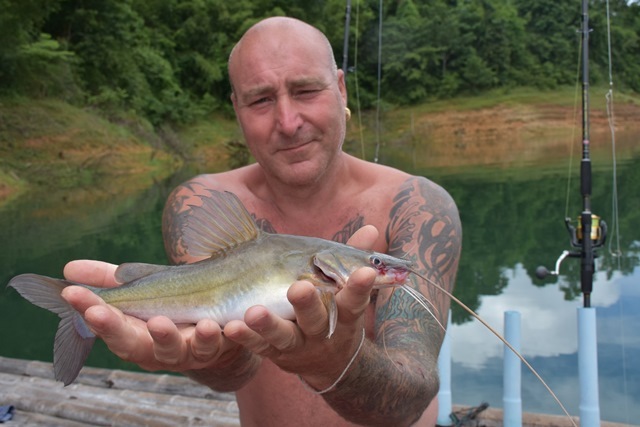 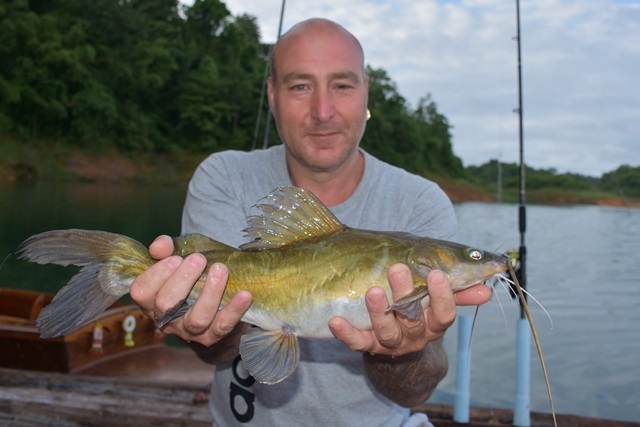 Tim also had a dabble this month catching a rarely caught striped snakehead, alligator gar, black ear catfish, African walking catfish and a black Amazon redtail. 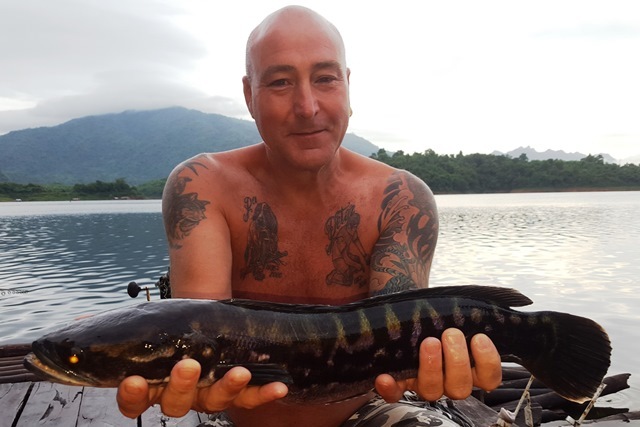 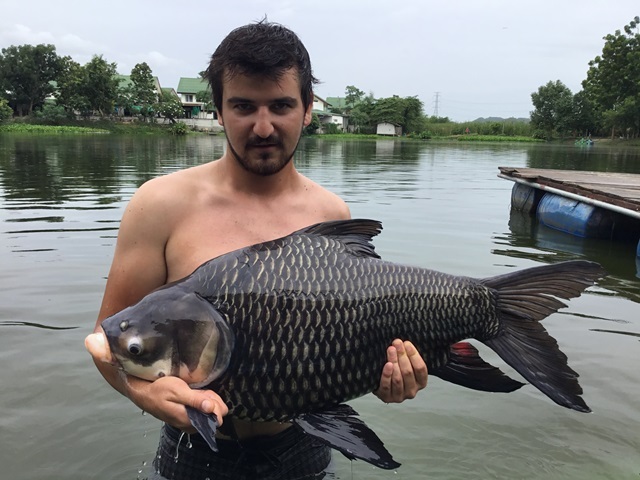 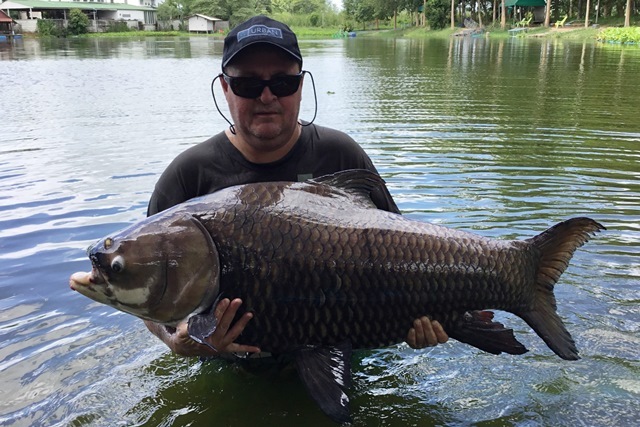 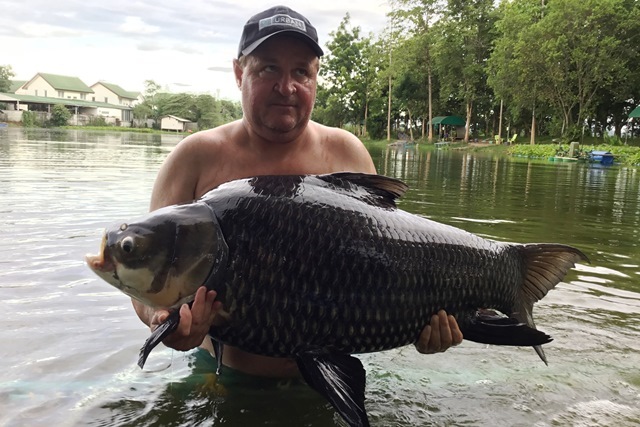 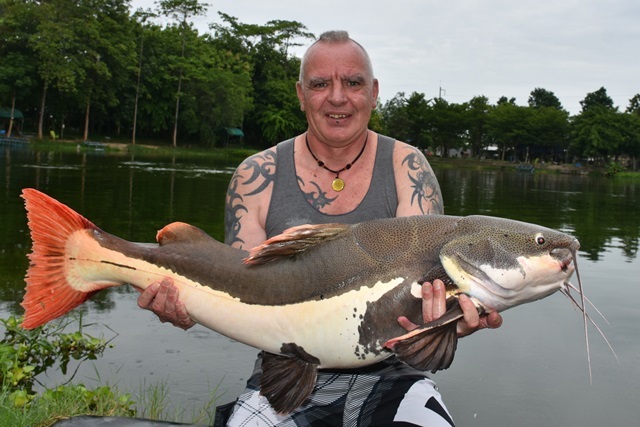 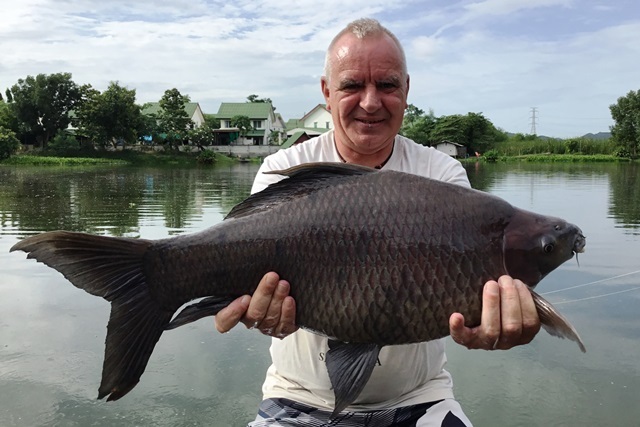 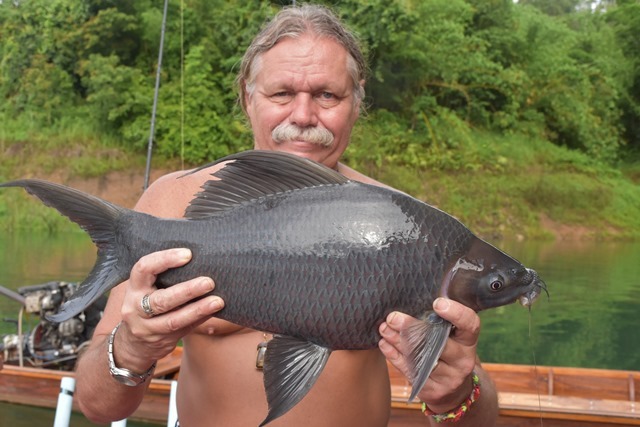 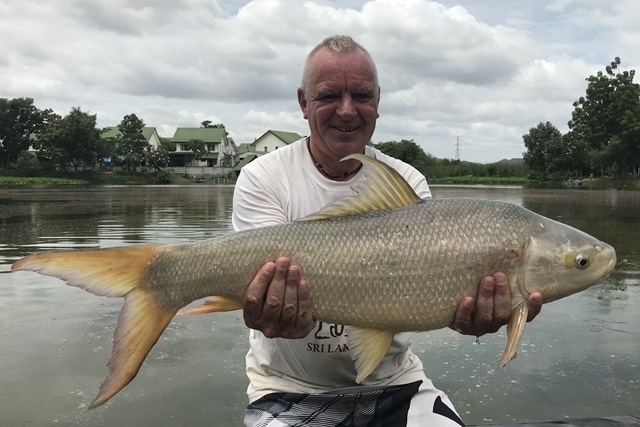 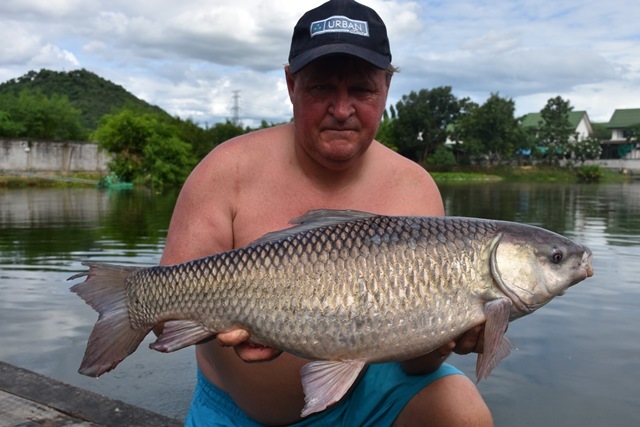 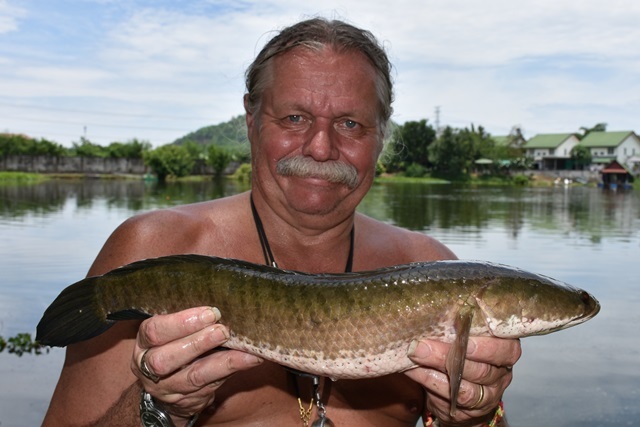 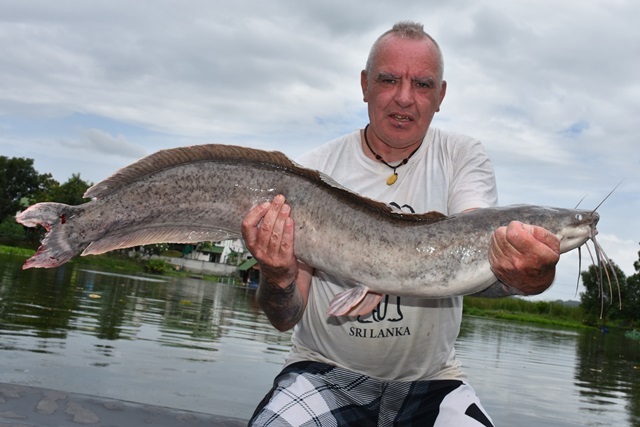 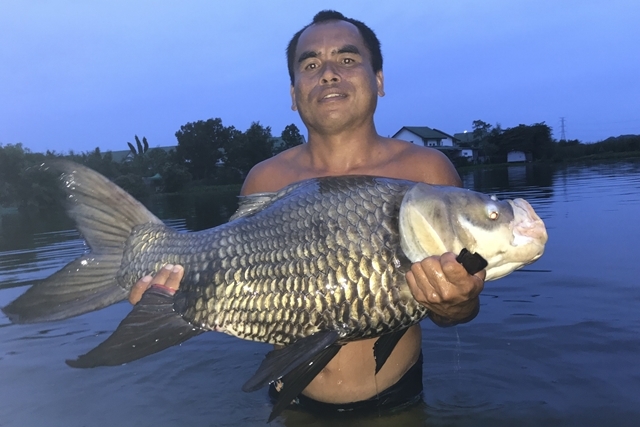 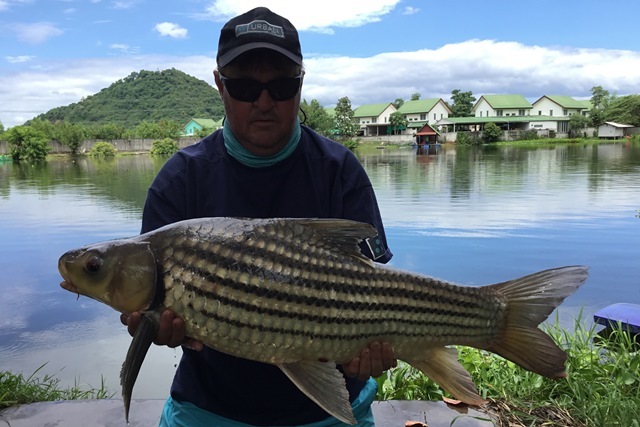 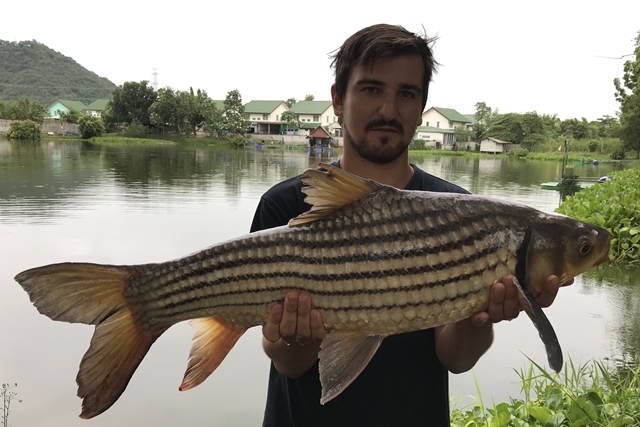 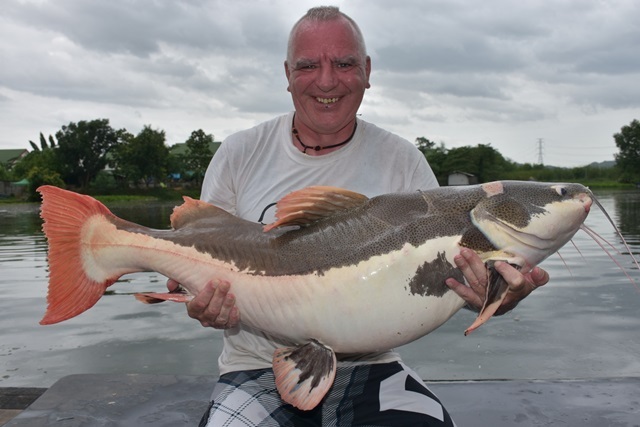 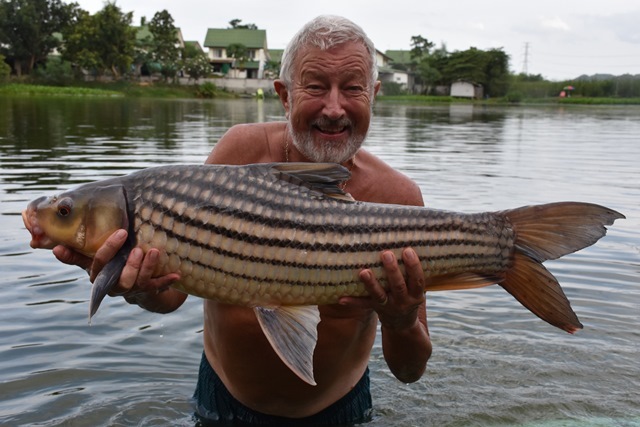 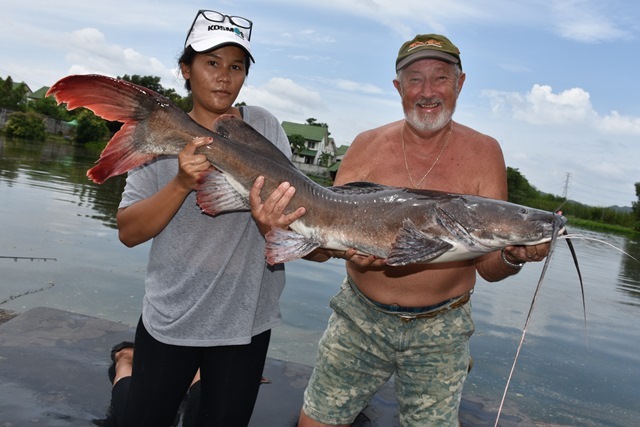 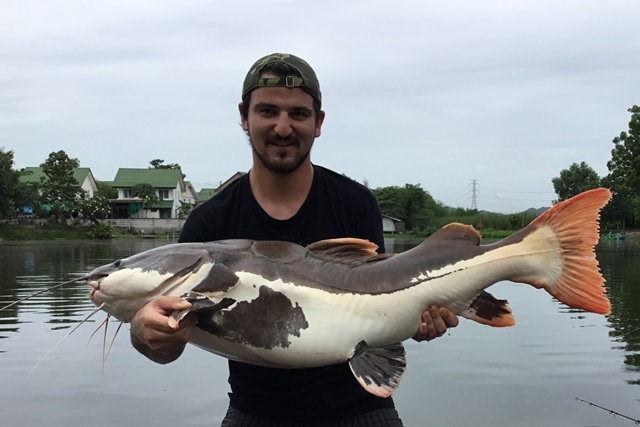 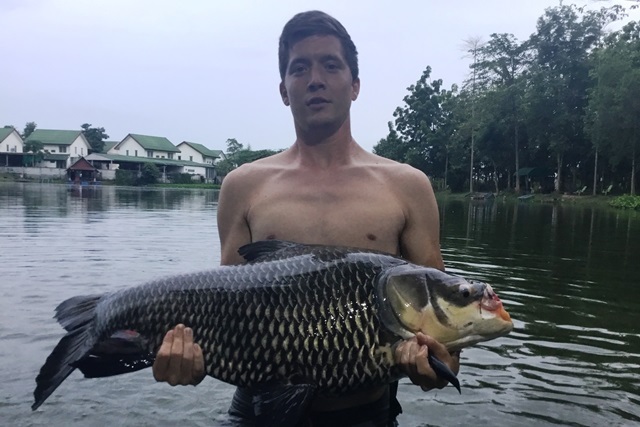 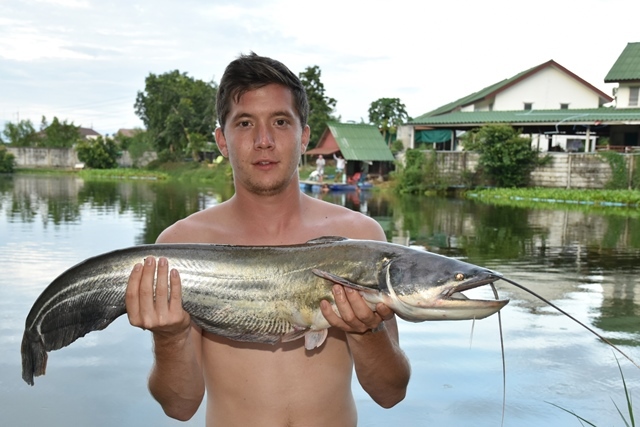 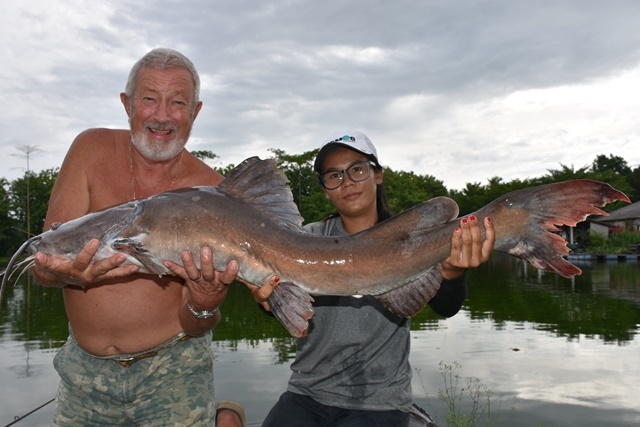 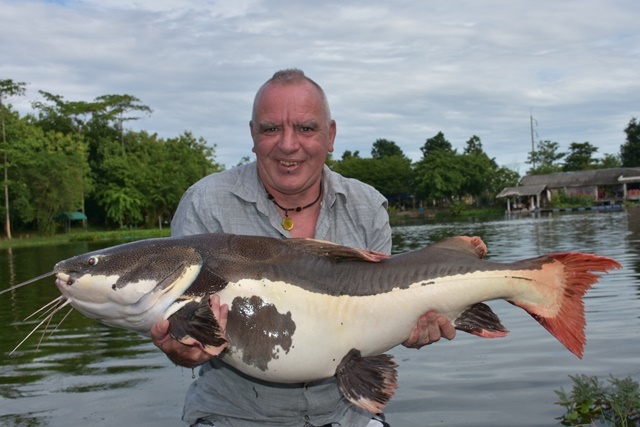 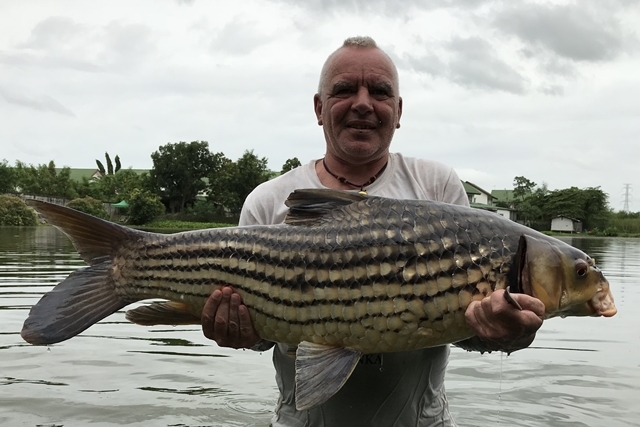 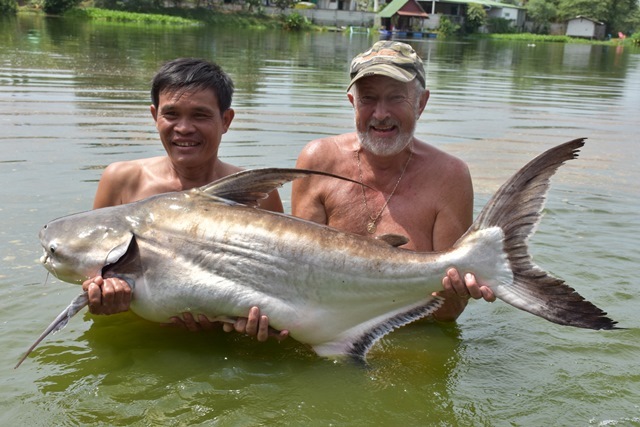 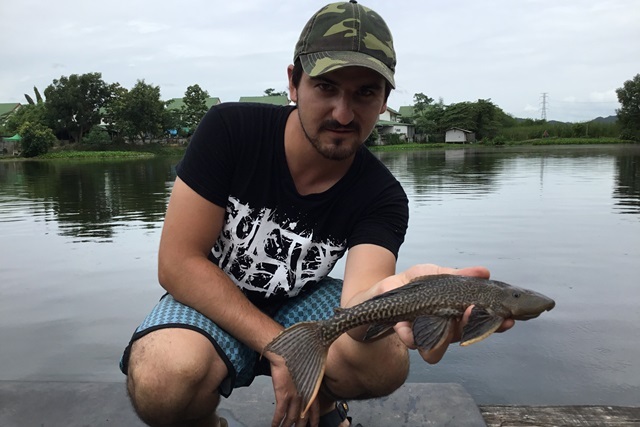 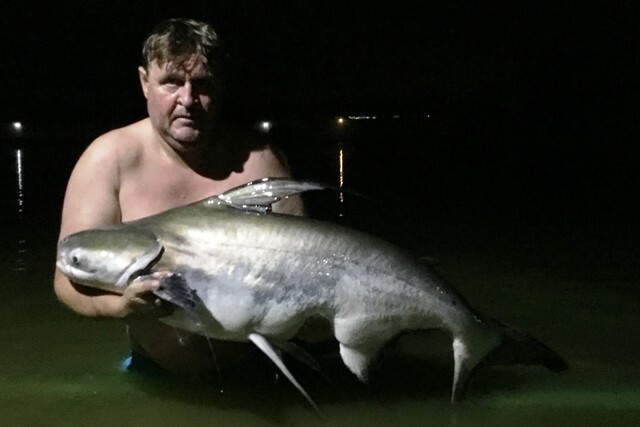 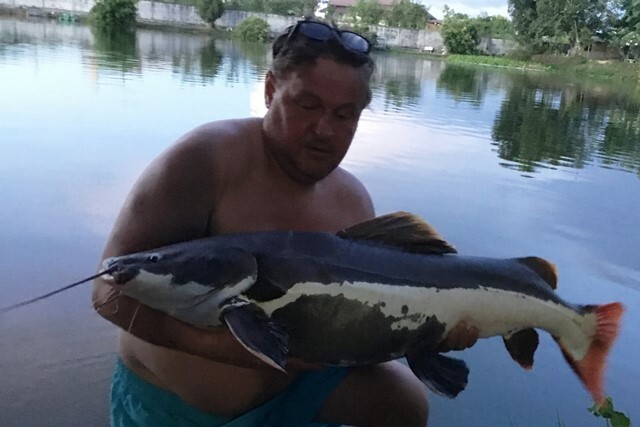 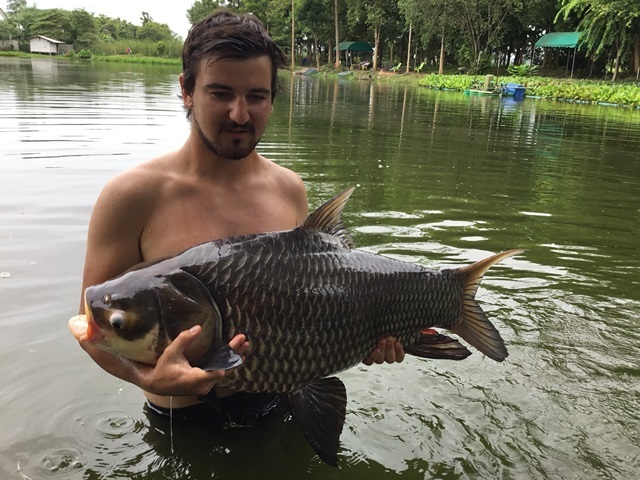 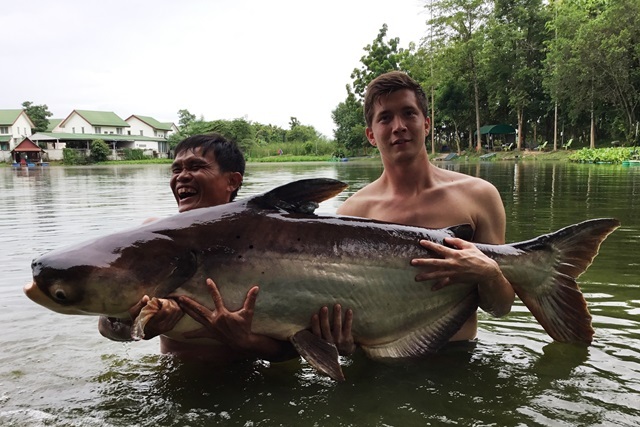 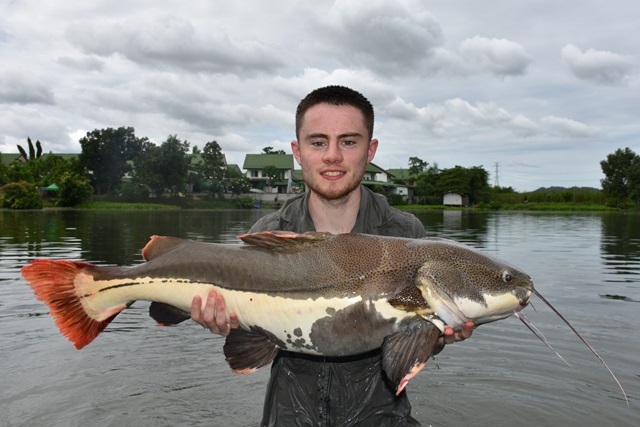 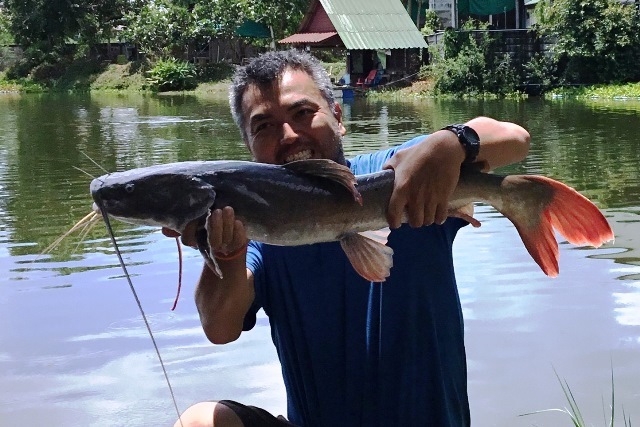 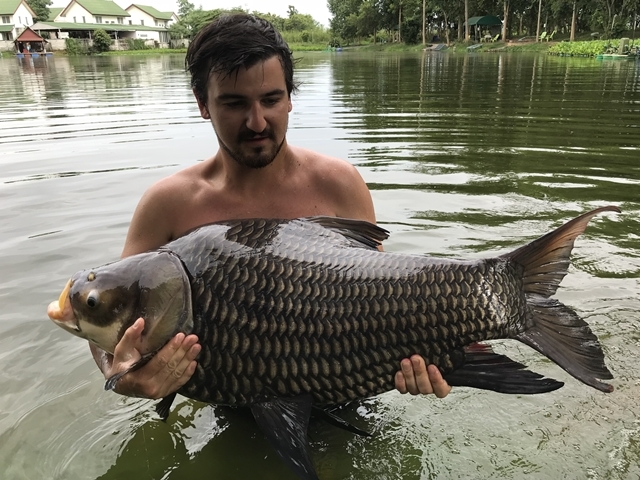 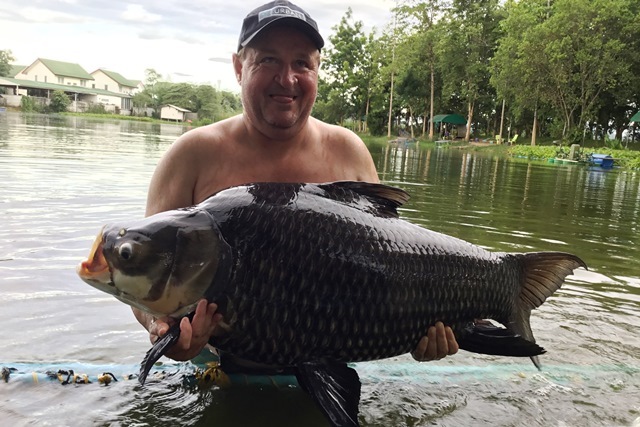 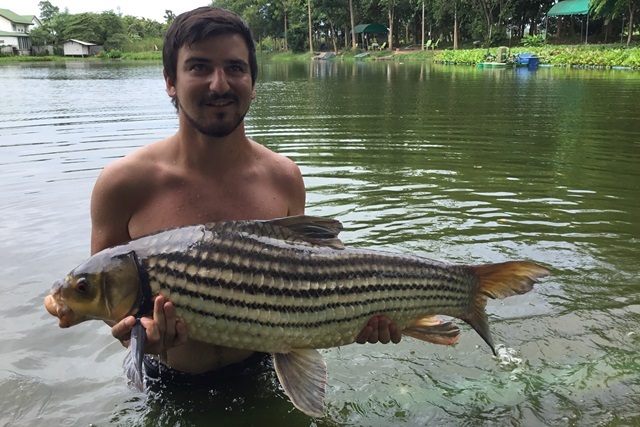 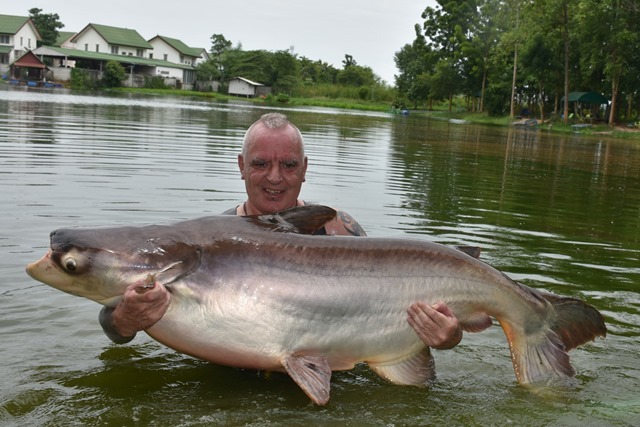 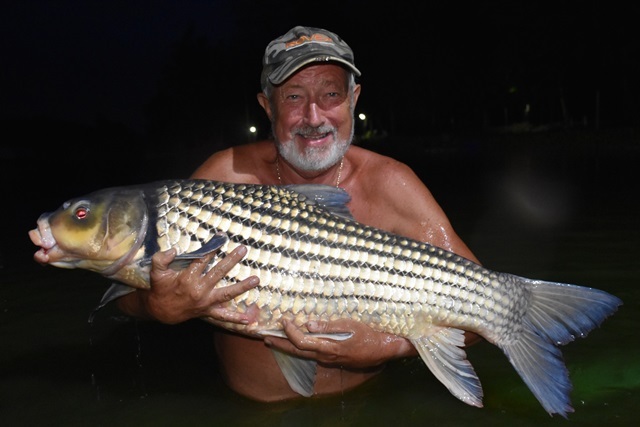 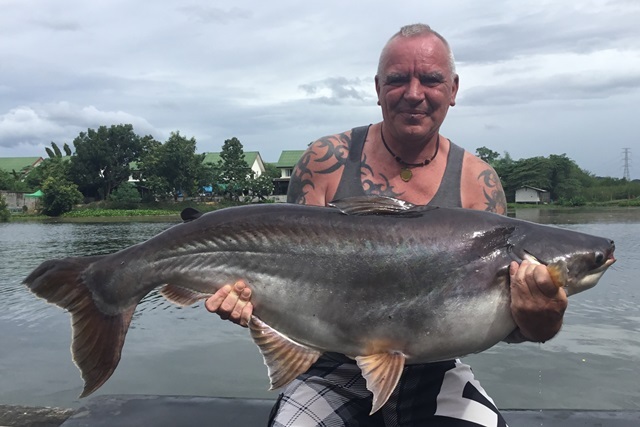 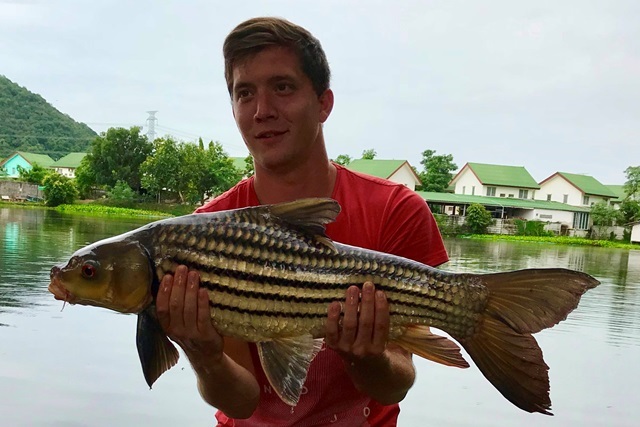 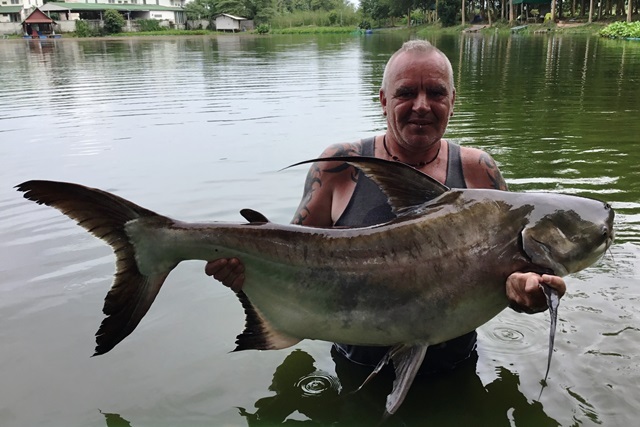 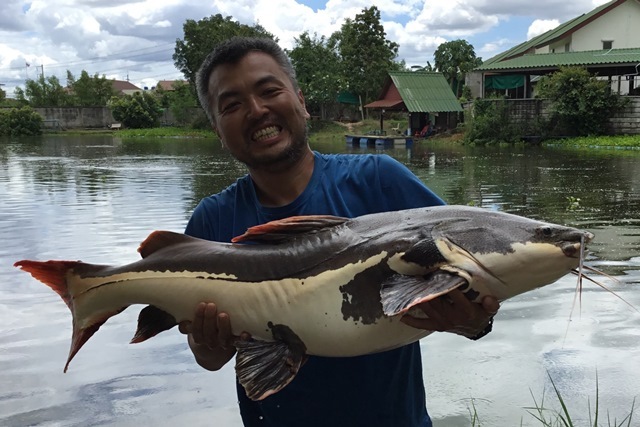 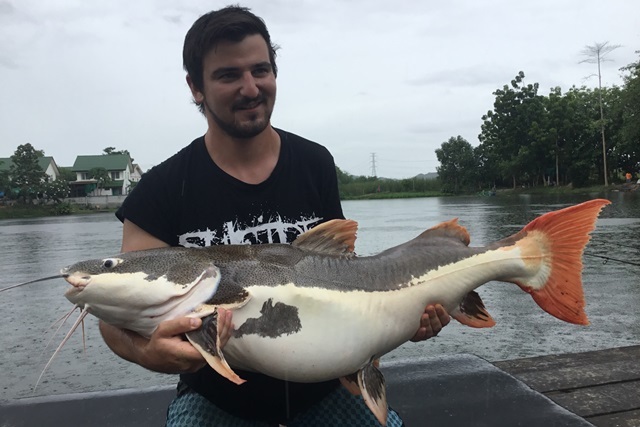 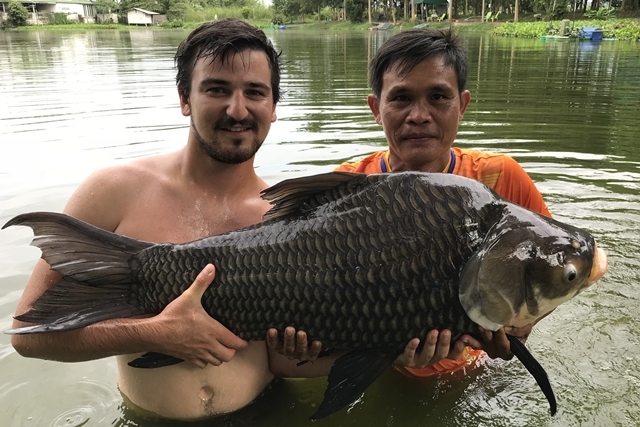 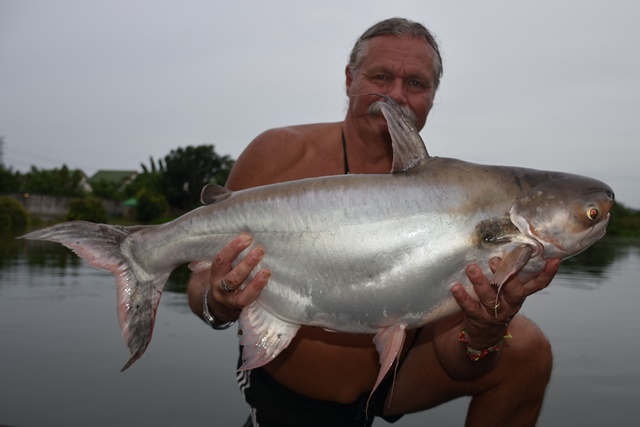 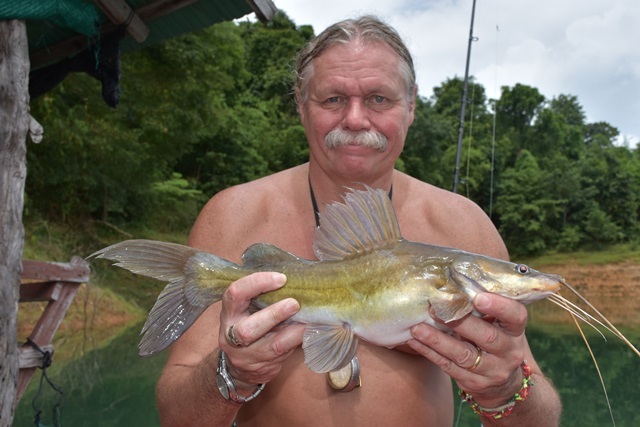 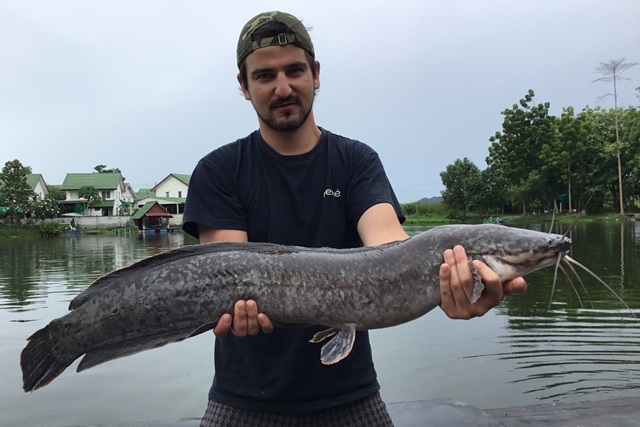 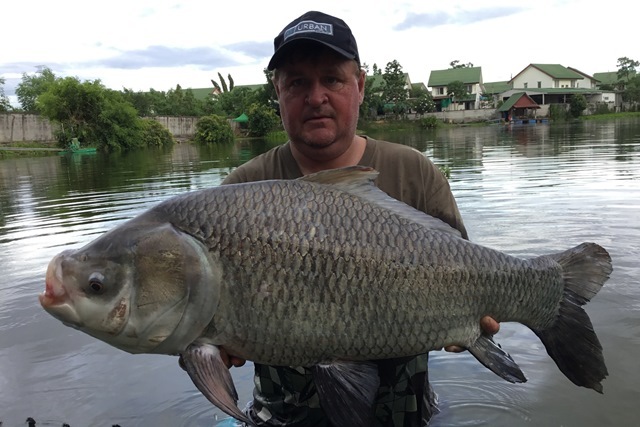 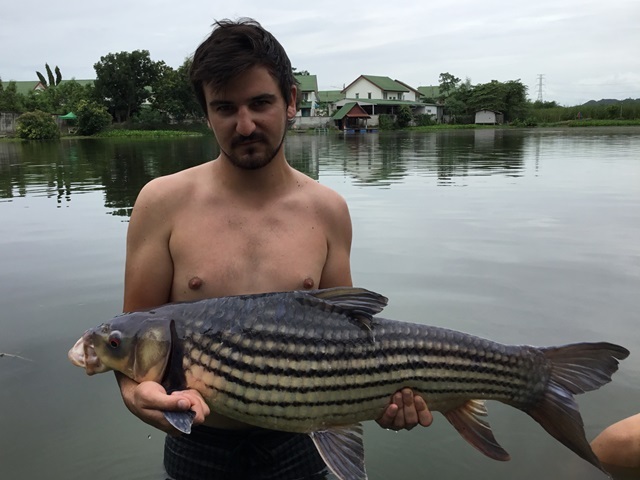 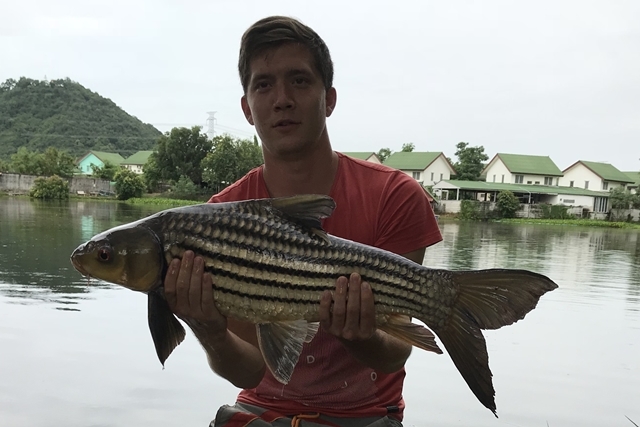 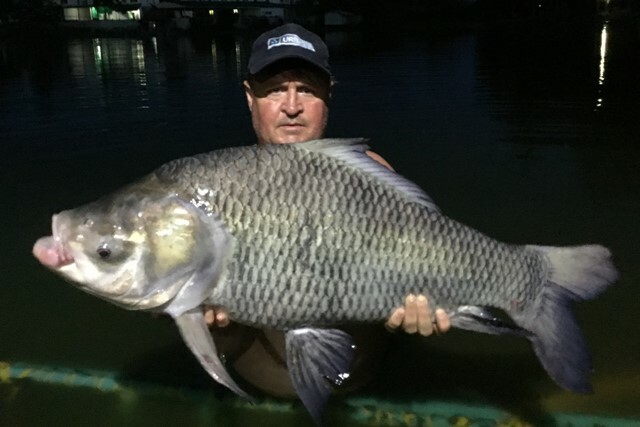 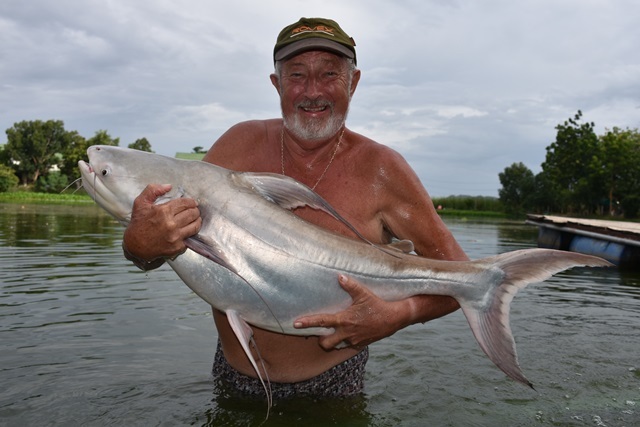 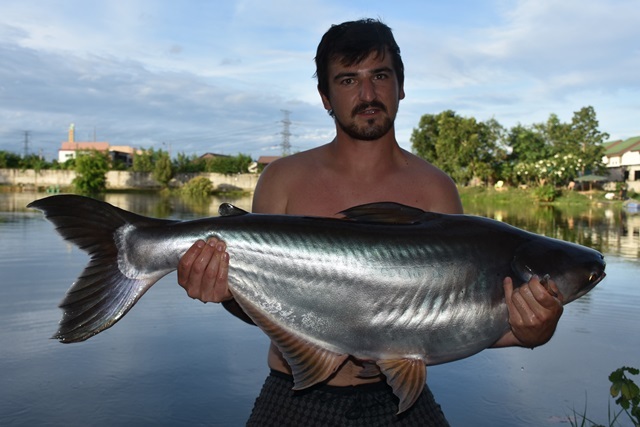 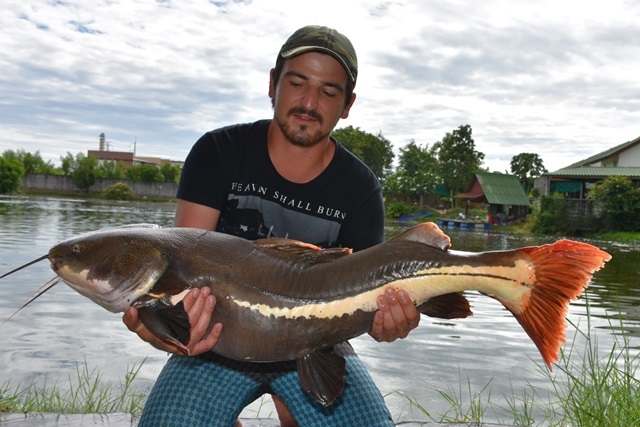 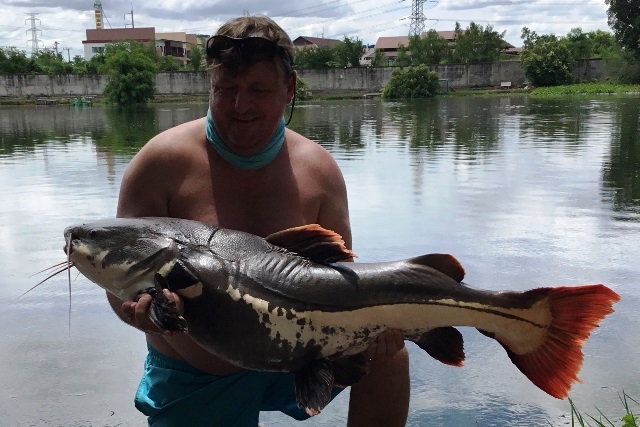 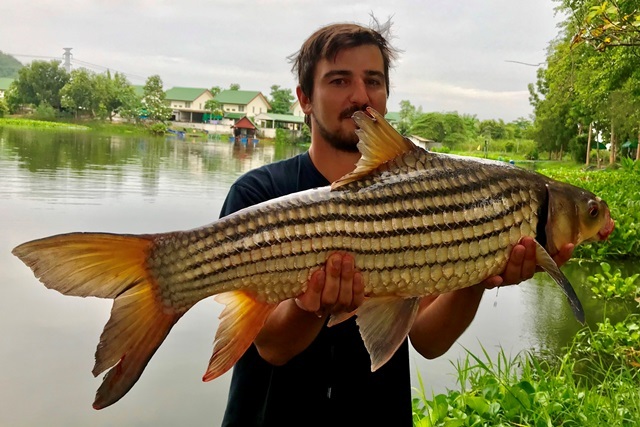 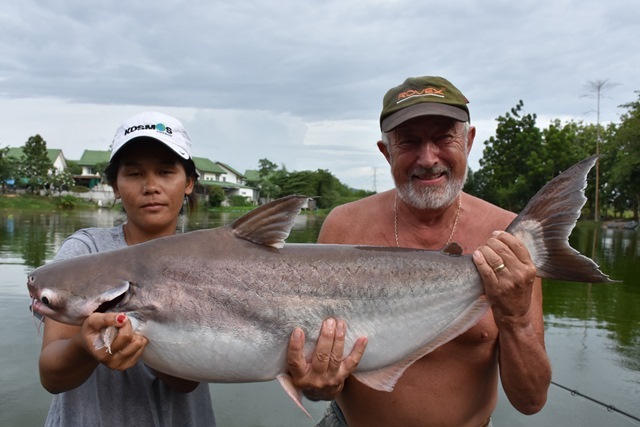 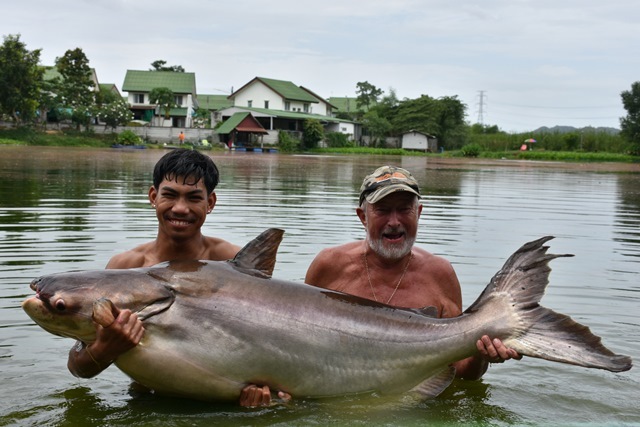 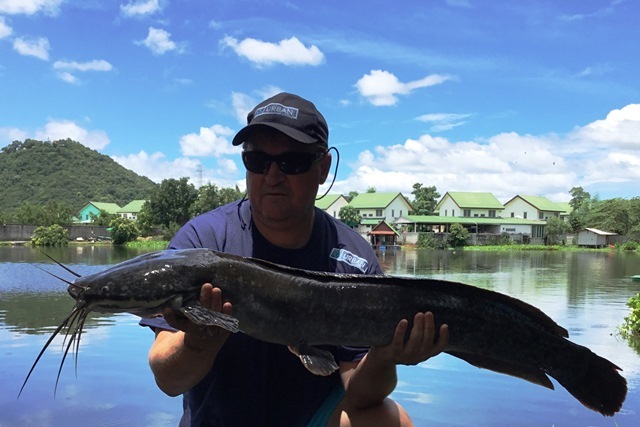 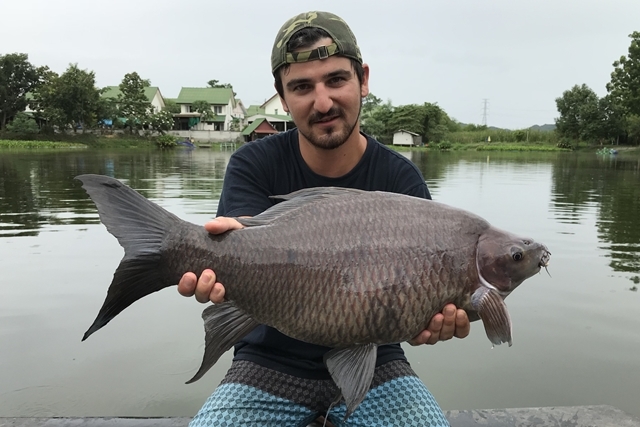 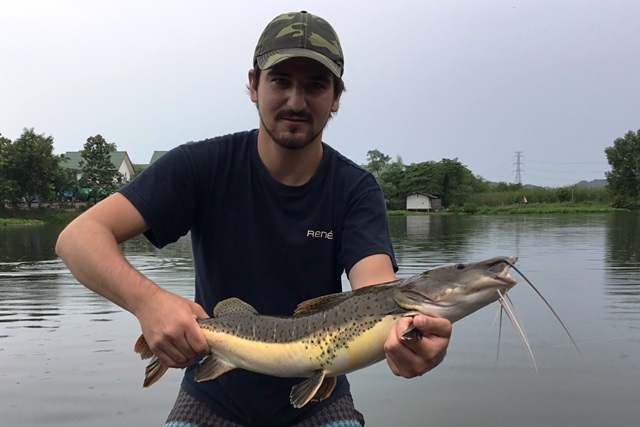 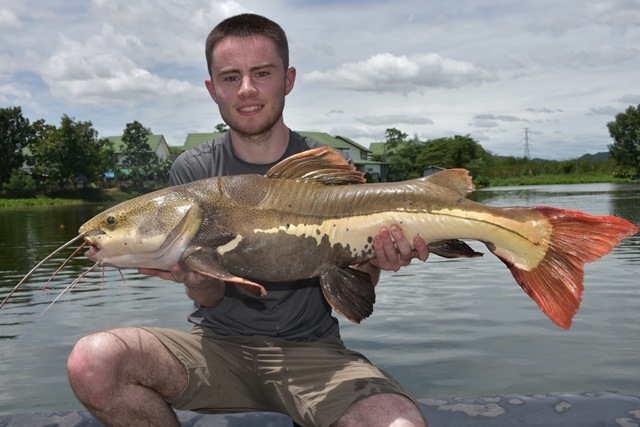 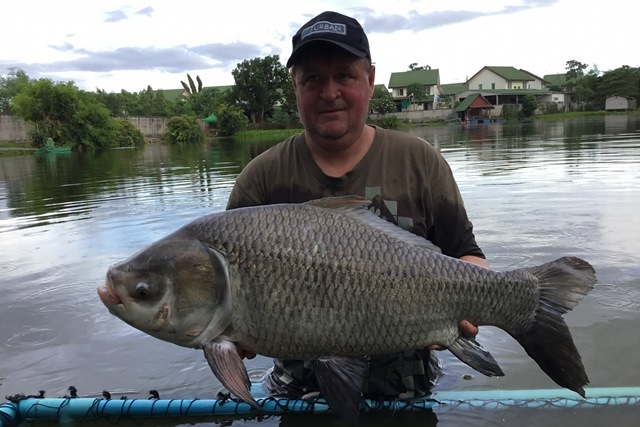 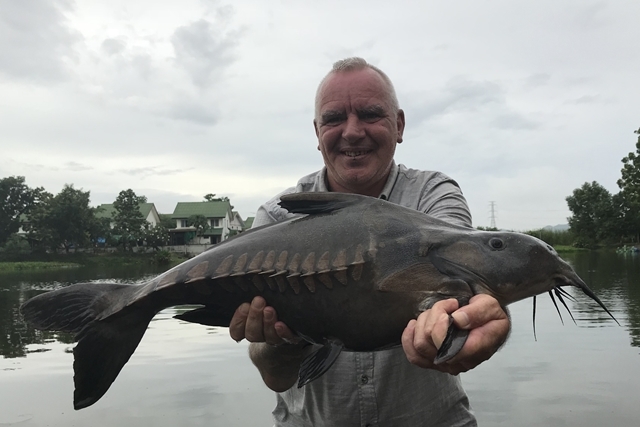 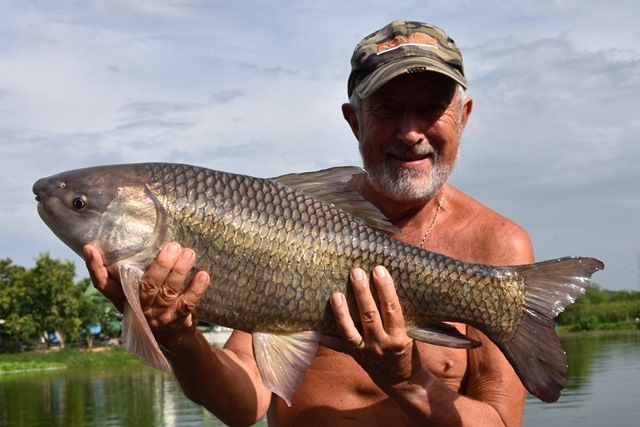 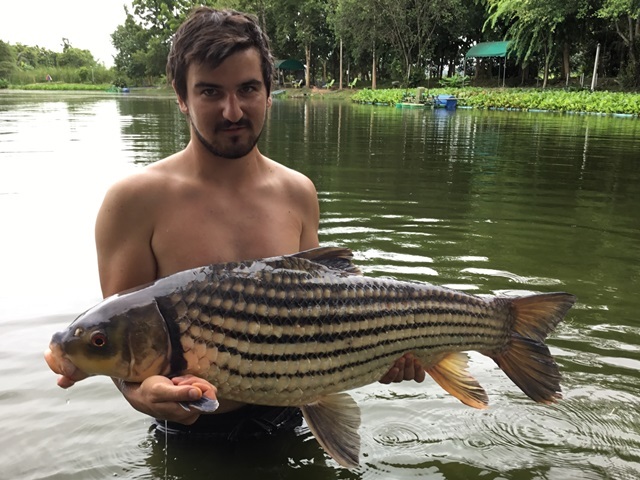 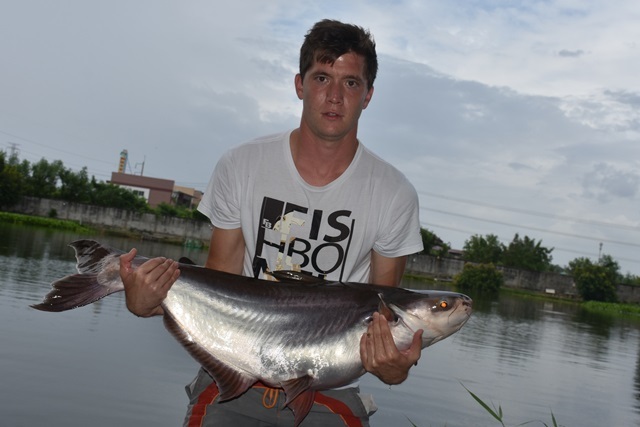 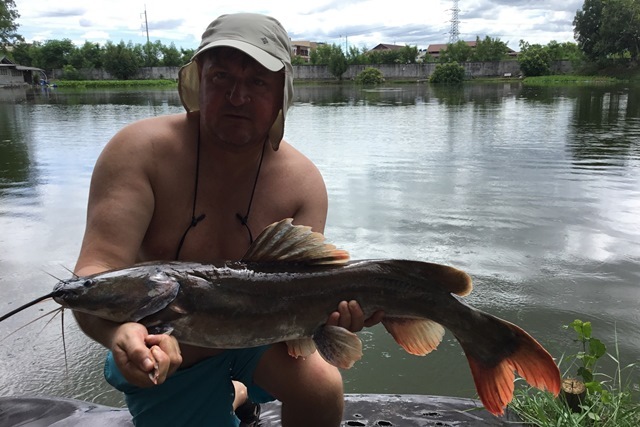 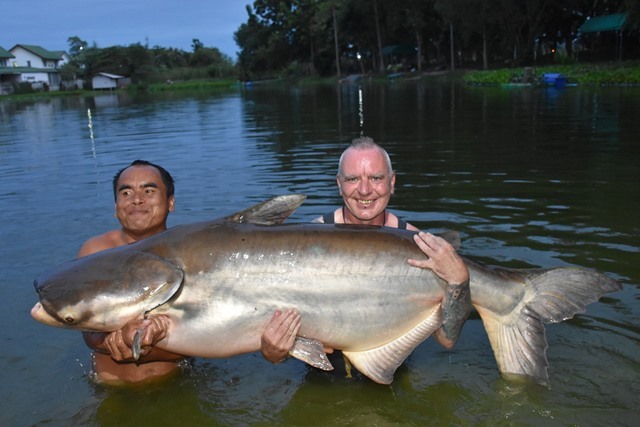 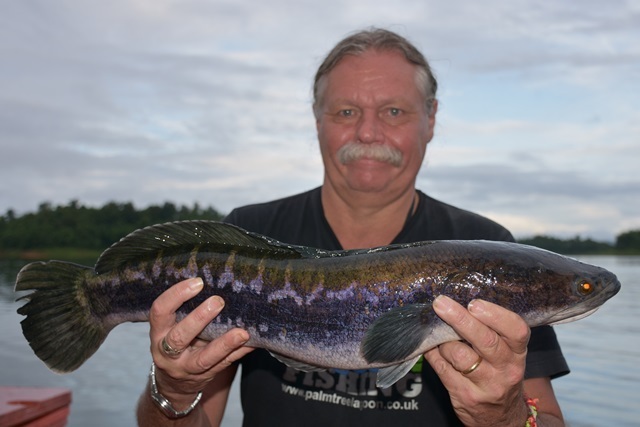 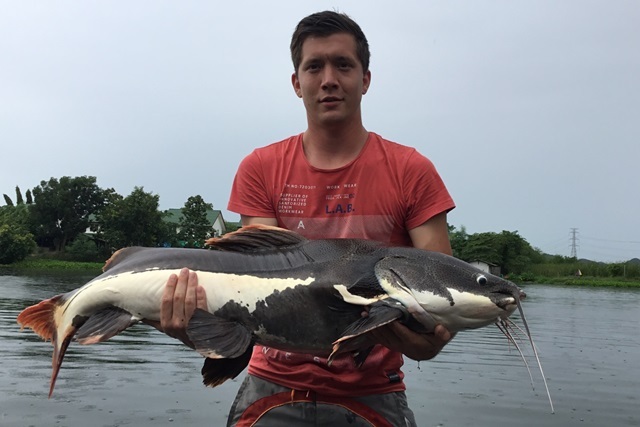 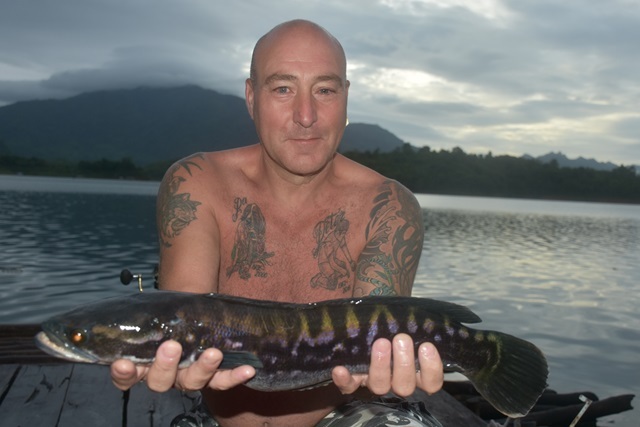 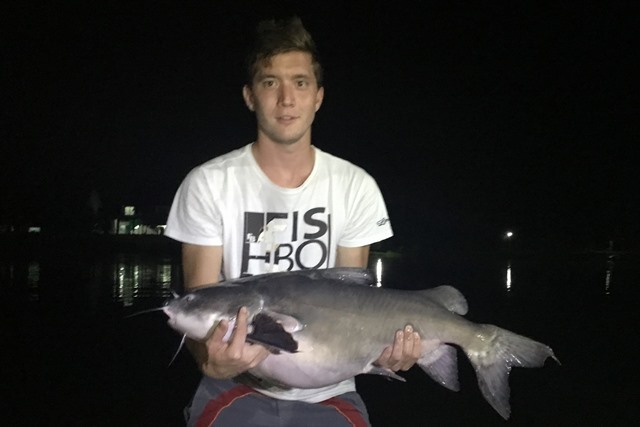 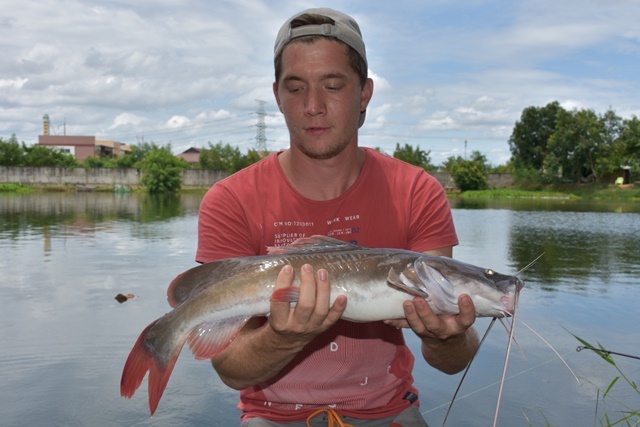 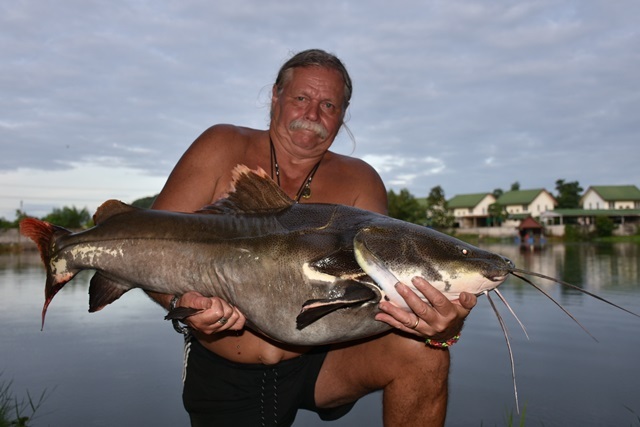 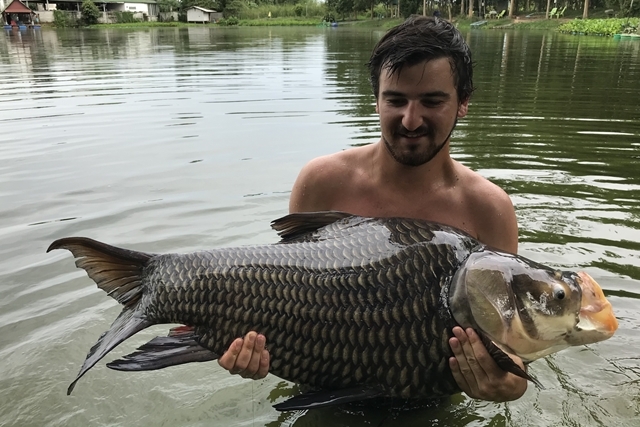 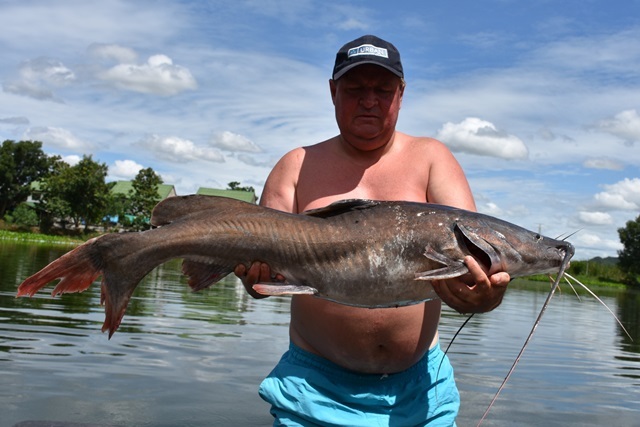 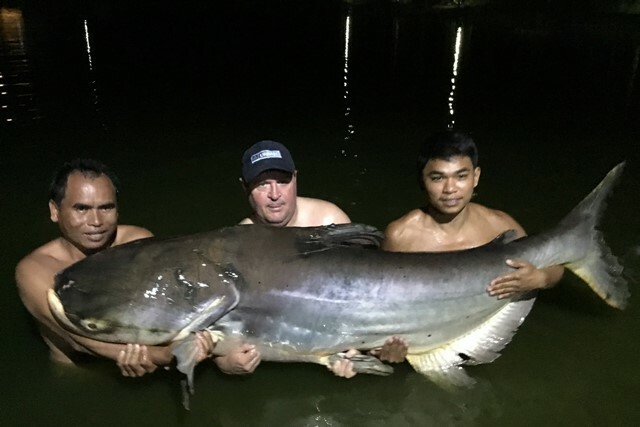 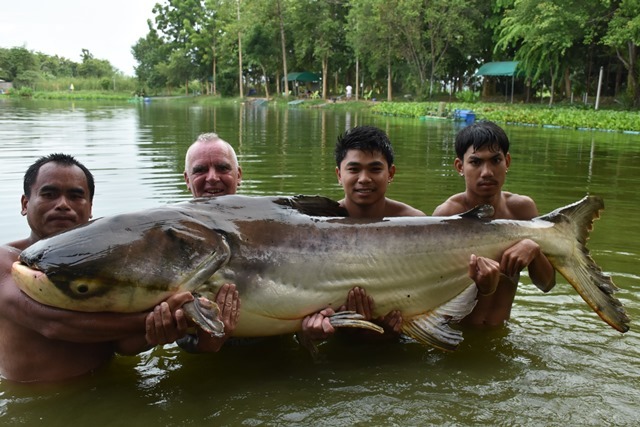 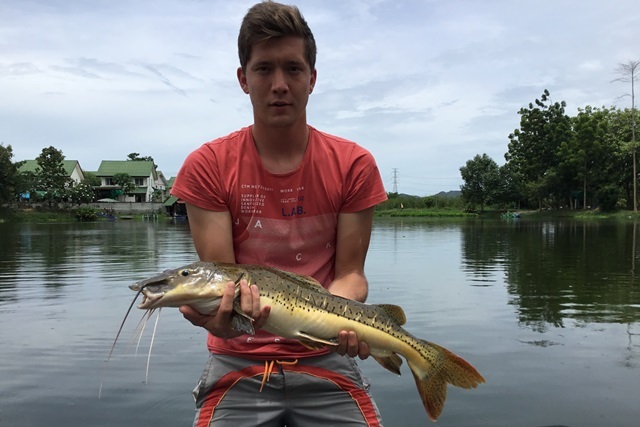 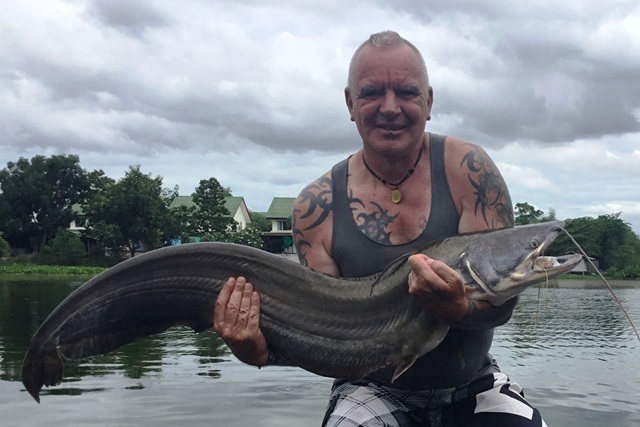 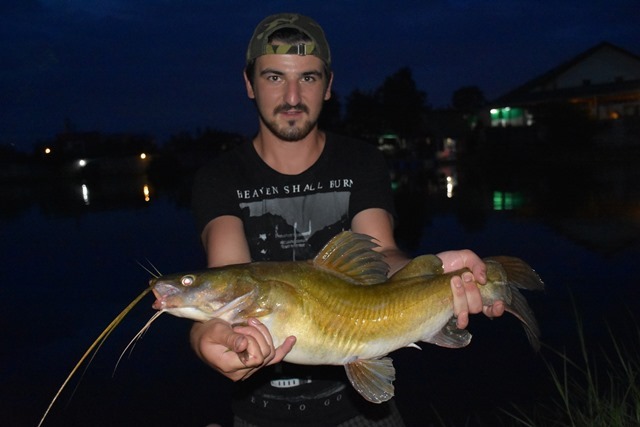 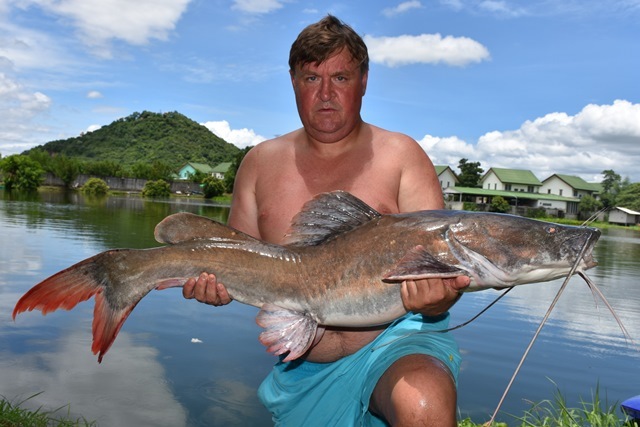 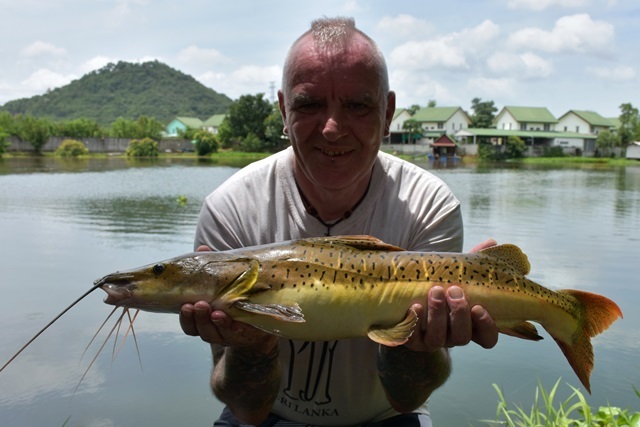 Austrian angler Rene Reider had a good first session at Palm Tree catching a rare Salween rita, as well as Mekong catfish, Siamese carp, wallago attu, rohu, Juliens golden price carp, striped catfish, leopard catfish, as well as both Asian and Amazon redtail. 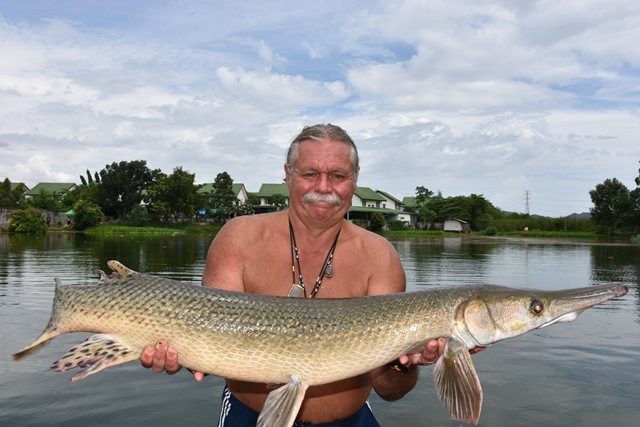 Philip Garbarrini popped in for a quick session catching alligator gar and Amazon redtail. 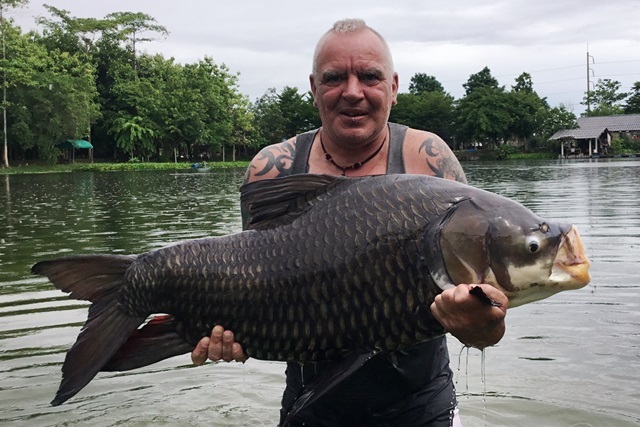 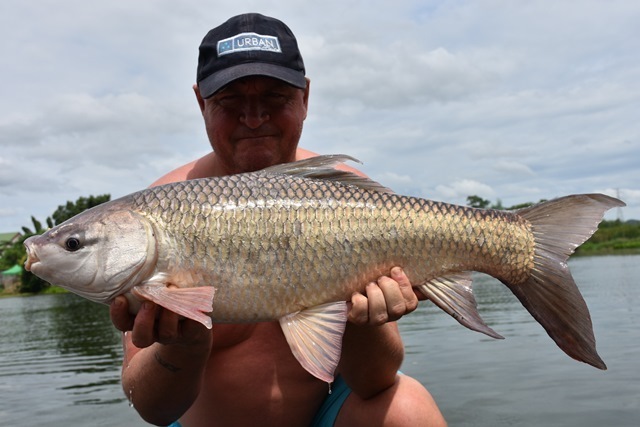 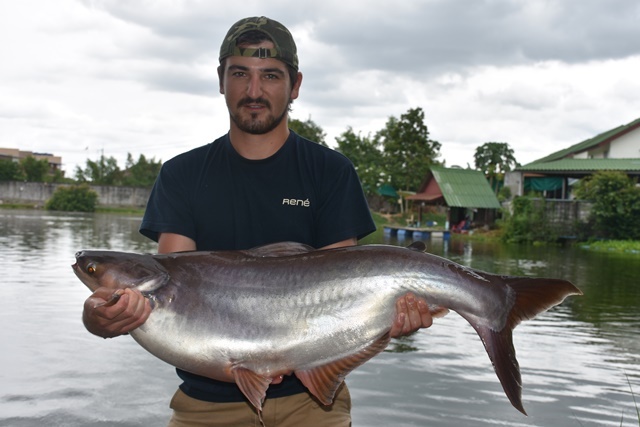 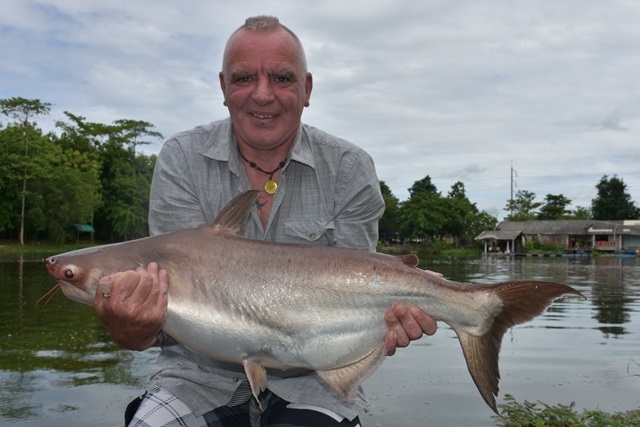 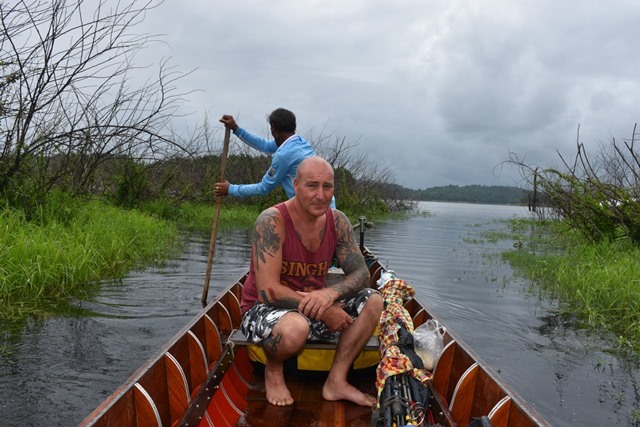 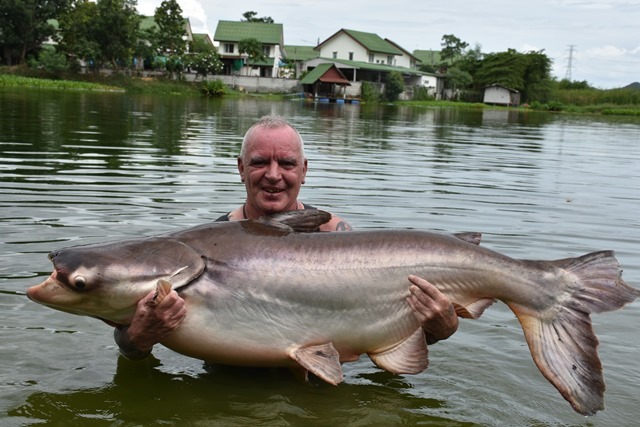 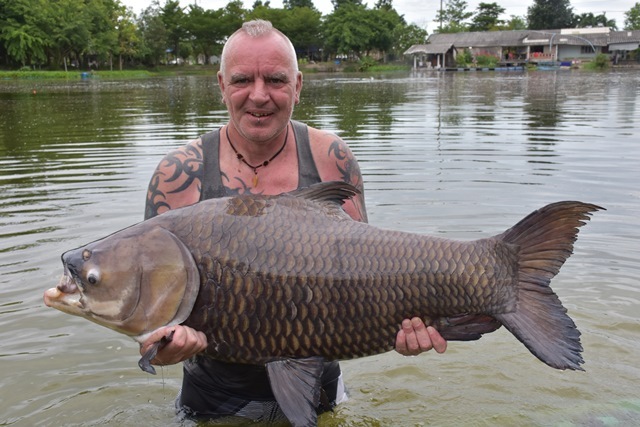 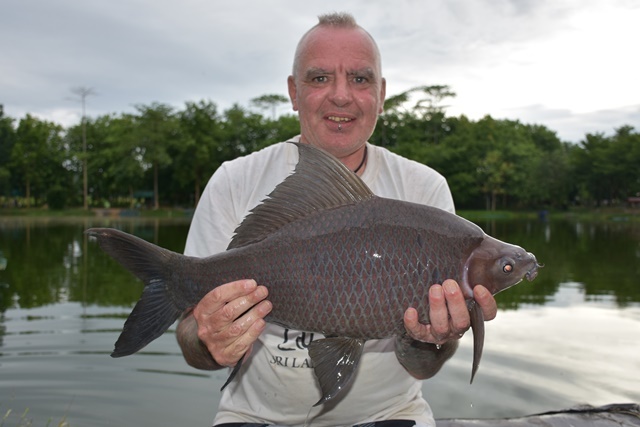 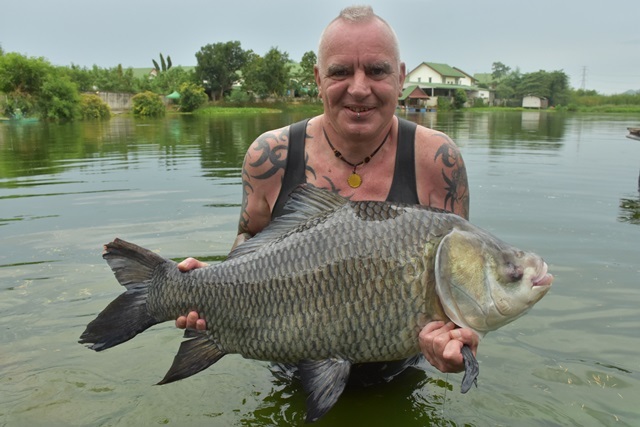 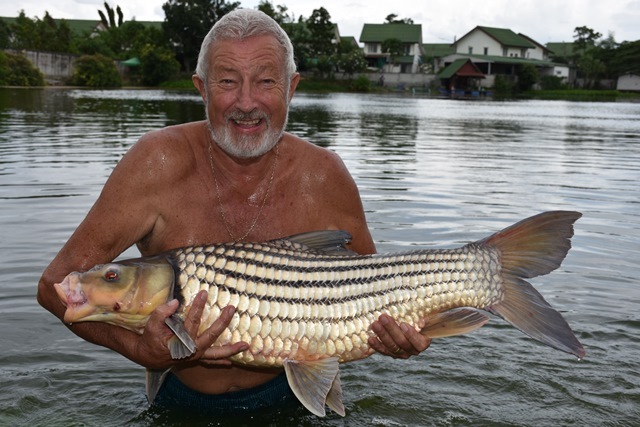 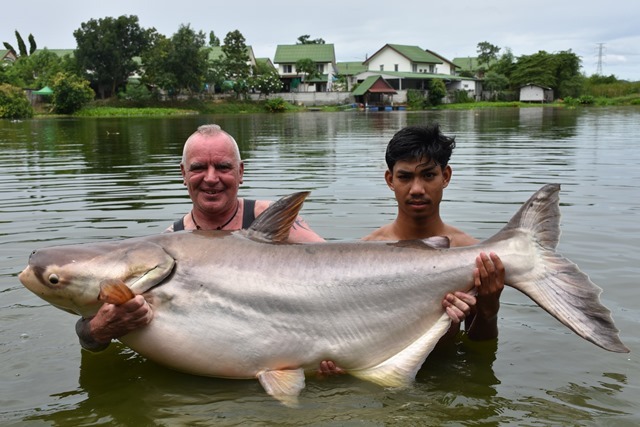 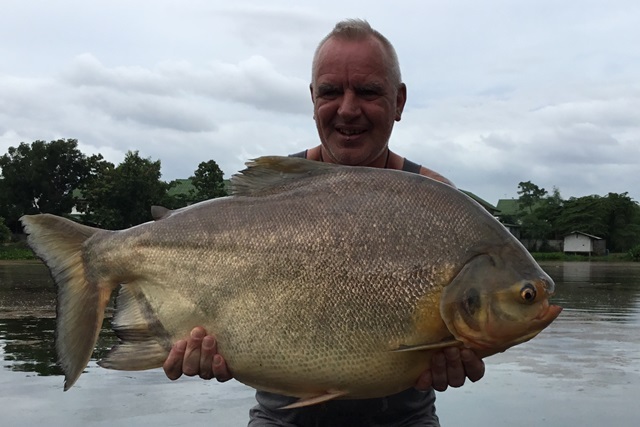 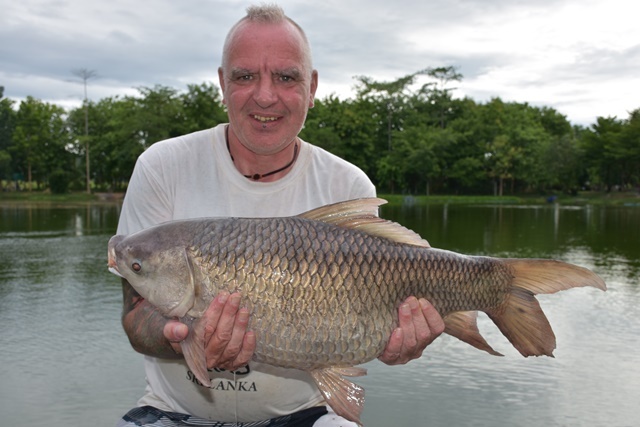 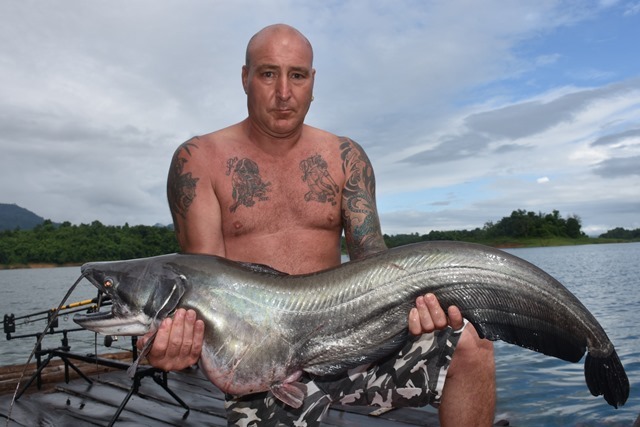 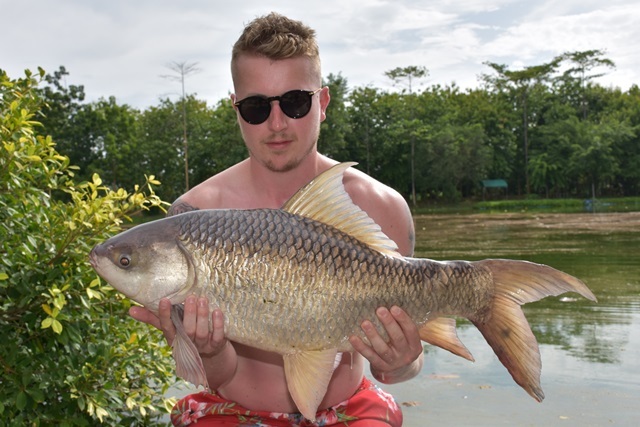 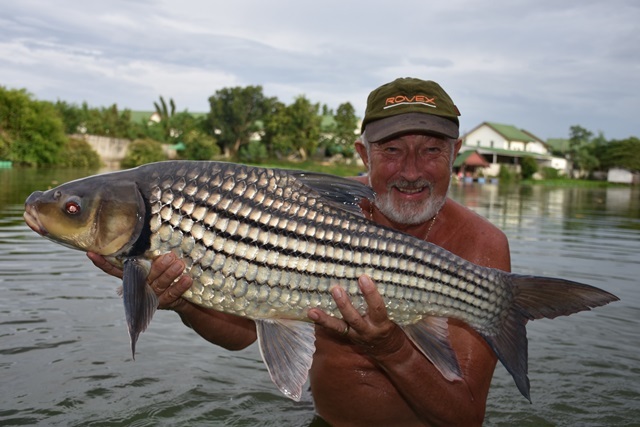 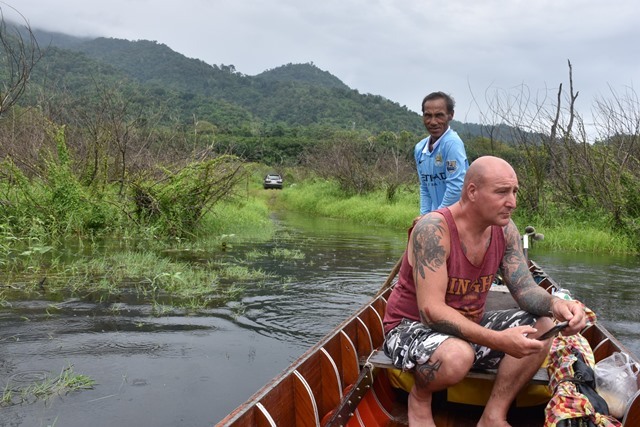 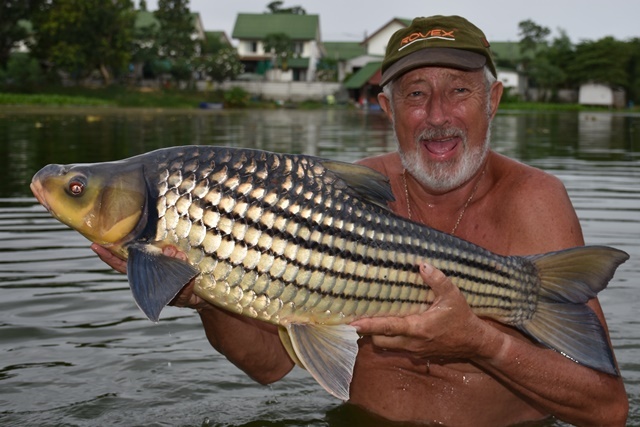 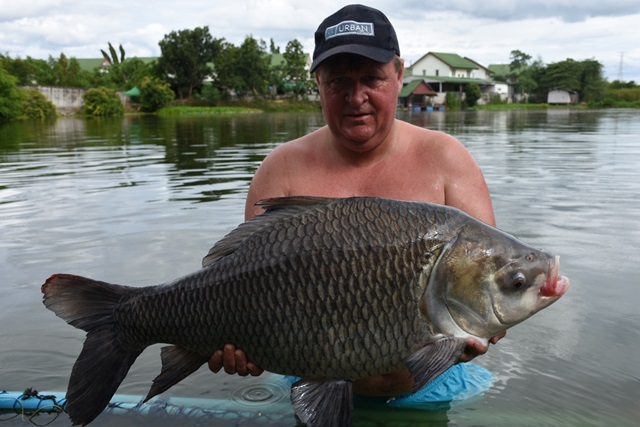 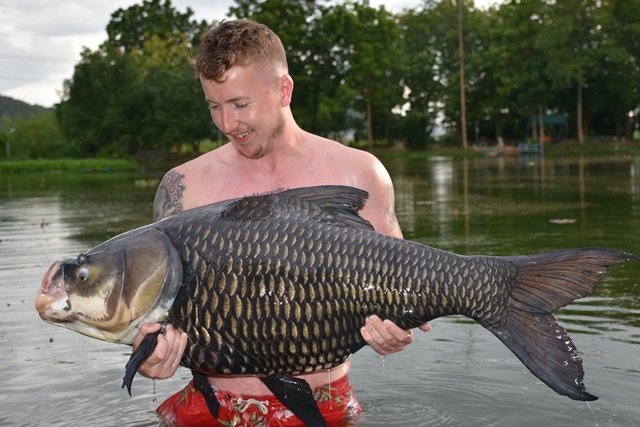 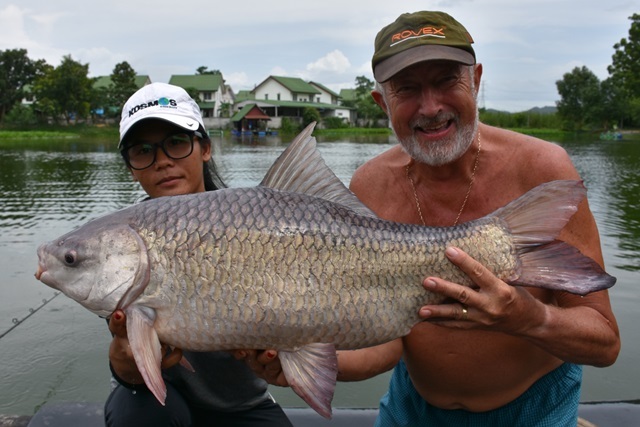 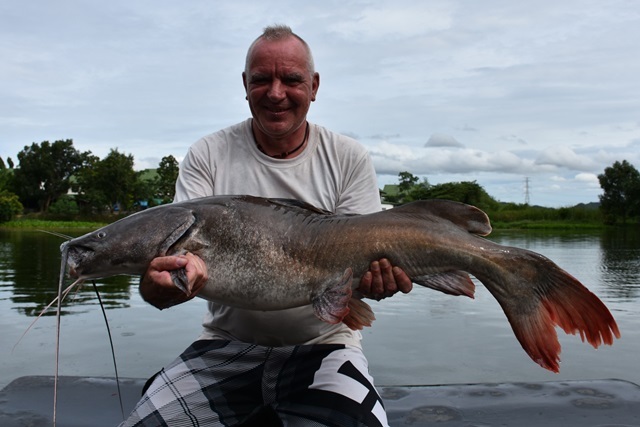 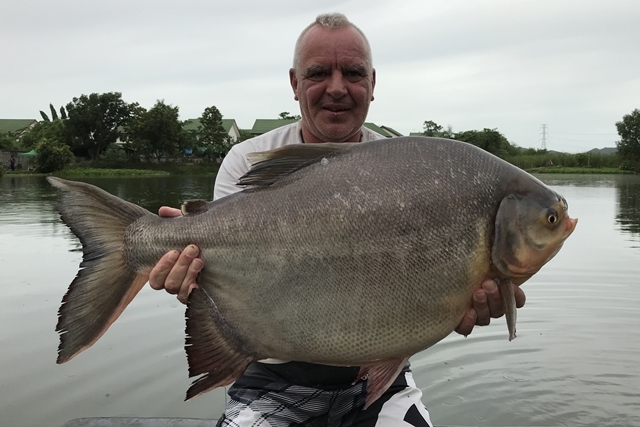 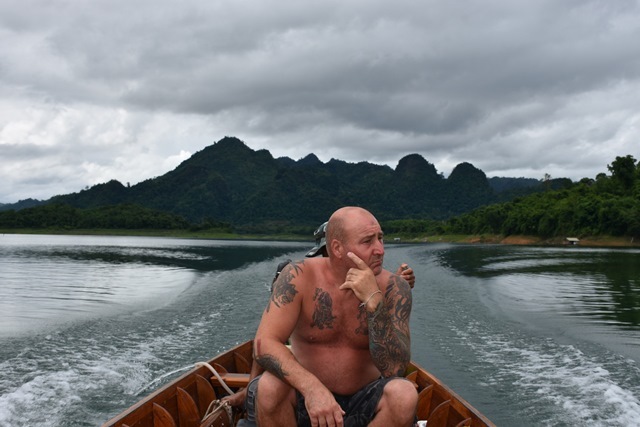 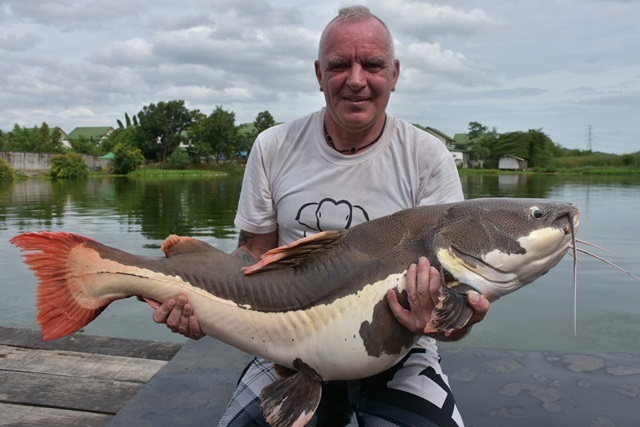 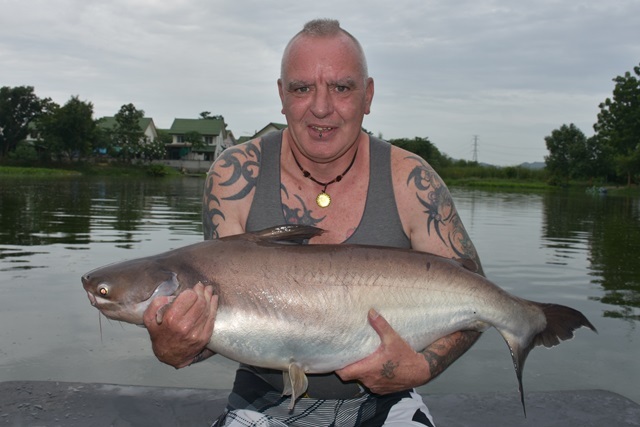 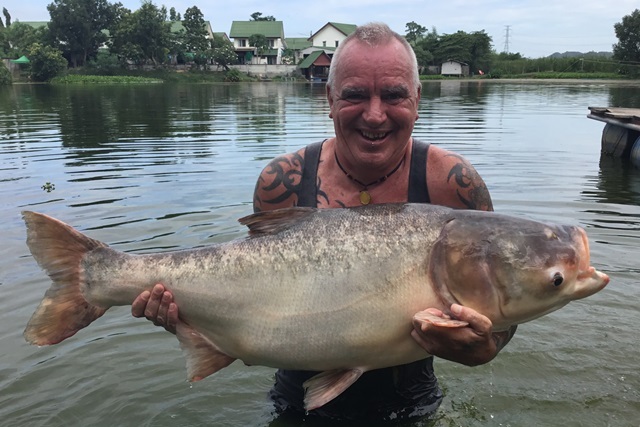 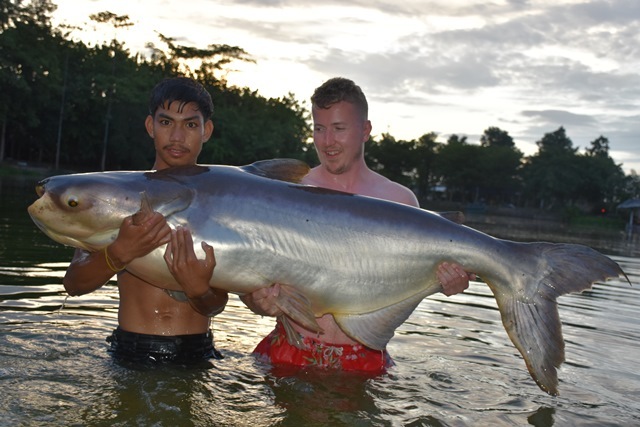 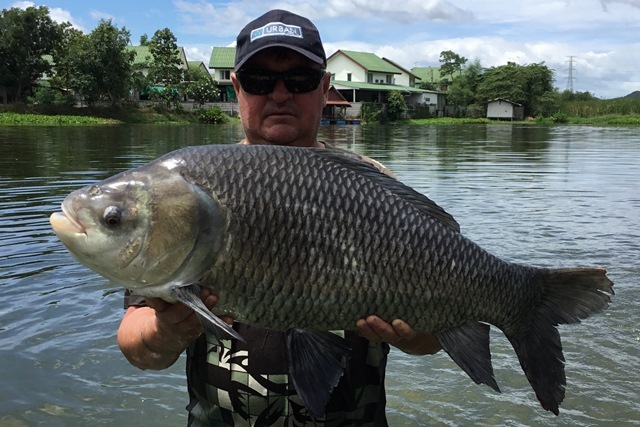 Deano Taylor returned after a two year absence successfully landing rohu, Mekong catfish, Siamese carp and striped catfish. 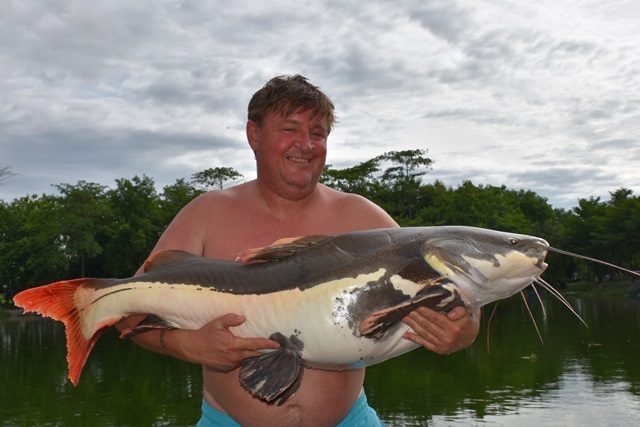 He also grabbed a photo with childhood hero the legendary John Wilson. 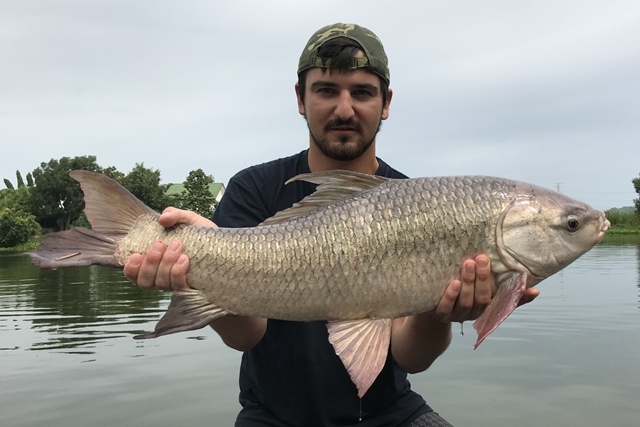 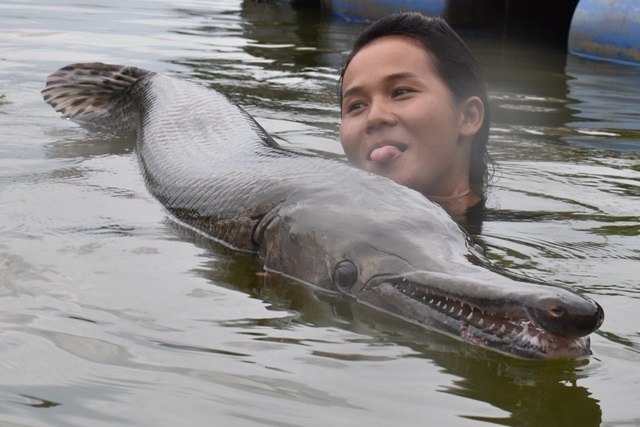 The guides were again in action this month catching some big alligator gar as well as catla carp, pacu, Juliens golden price carp, Amazon redtail, and Siamese carp. 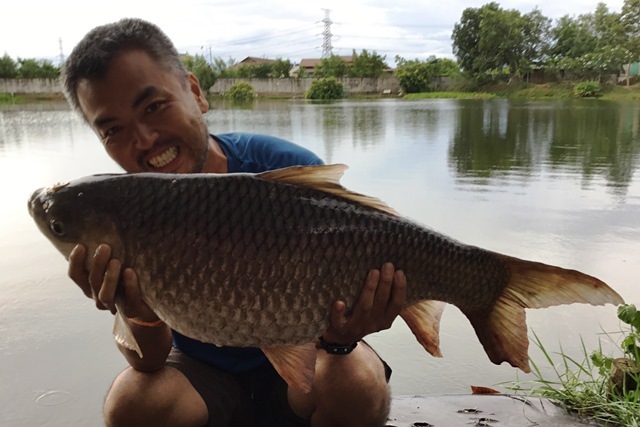 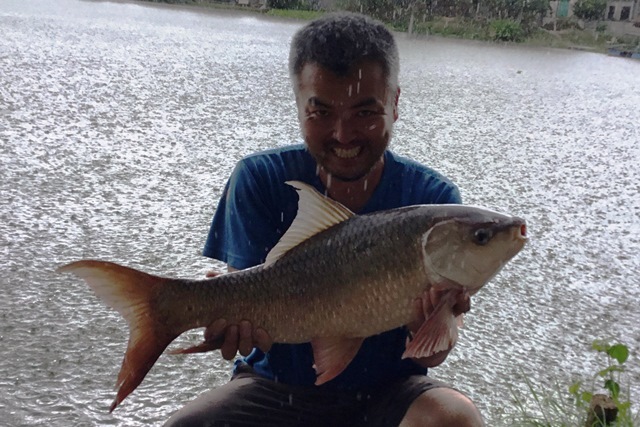 Japanese angler Kazuya Tanaka returned and was again all smiles this time with his catches of rohu as well as both Amazon and Asian redtail.